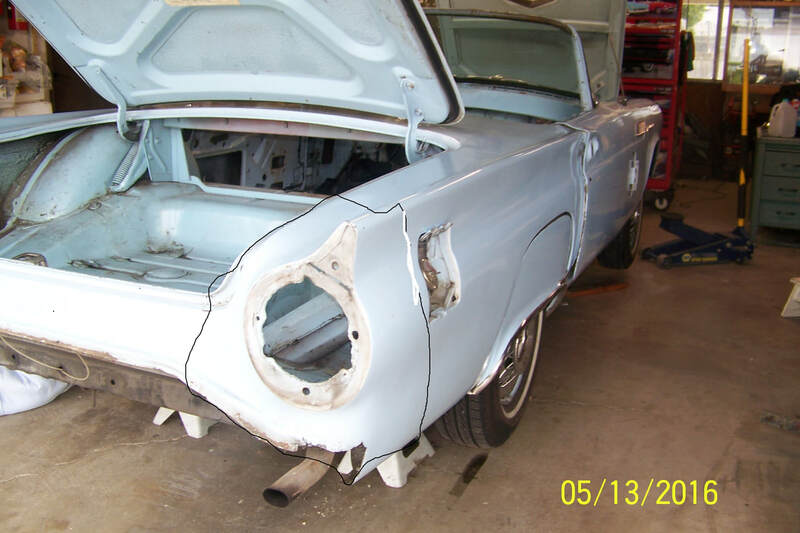 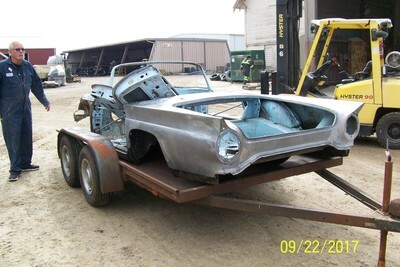 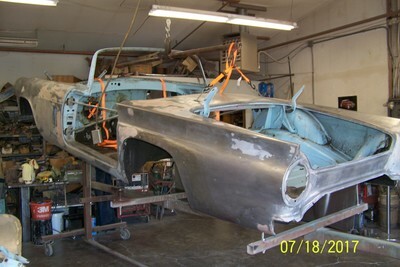 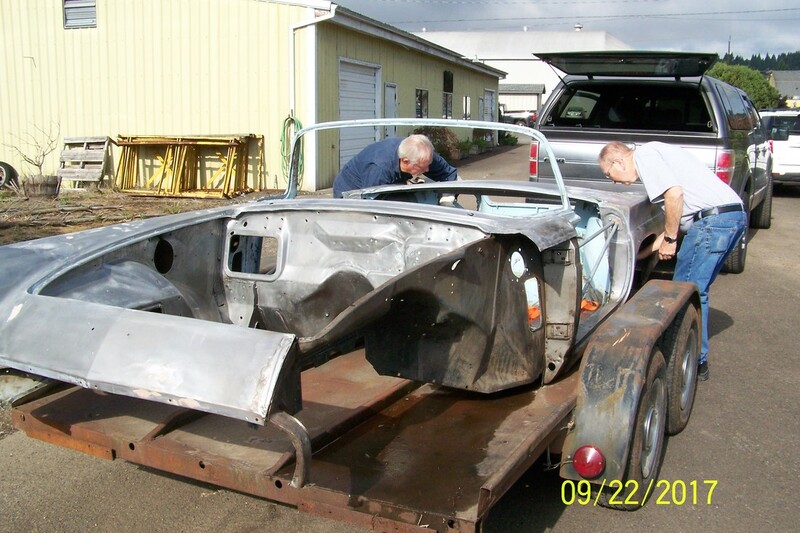 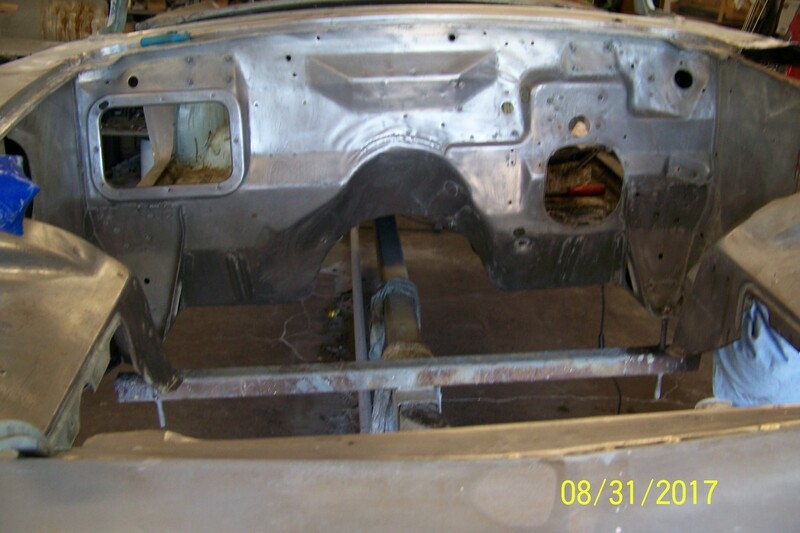 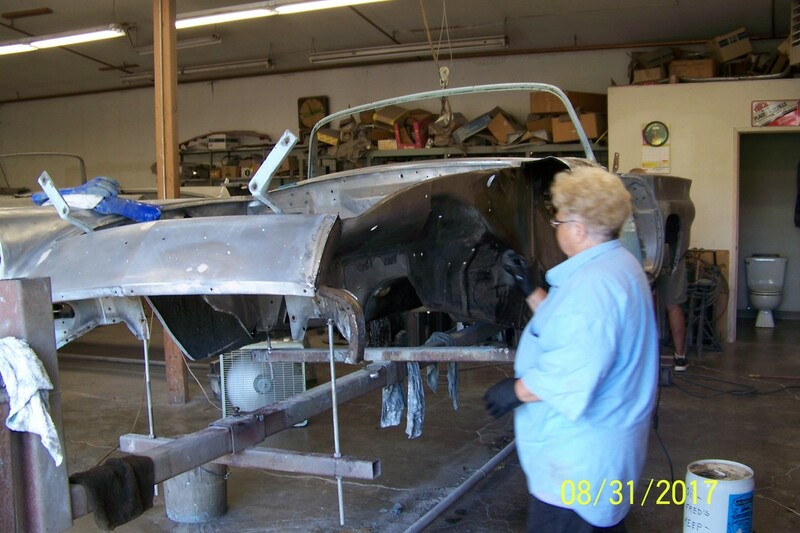 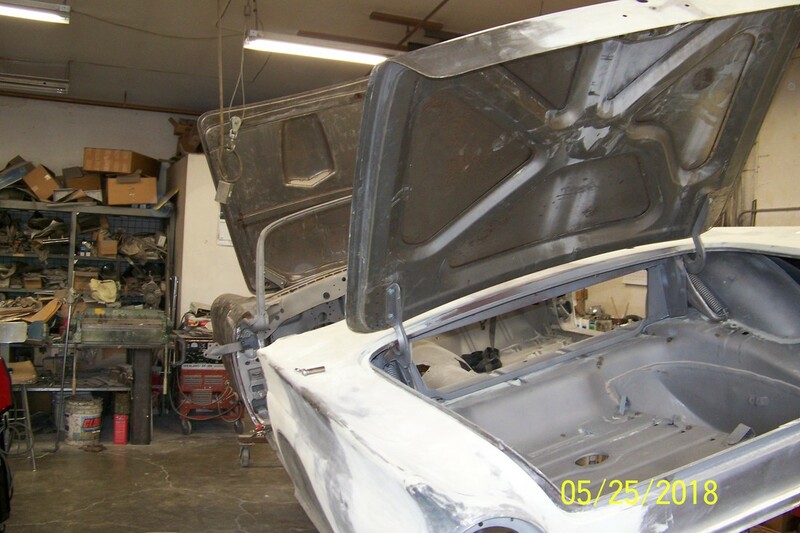 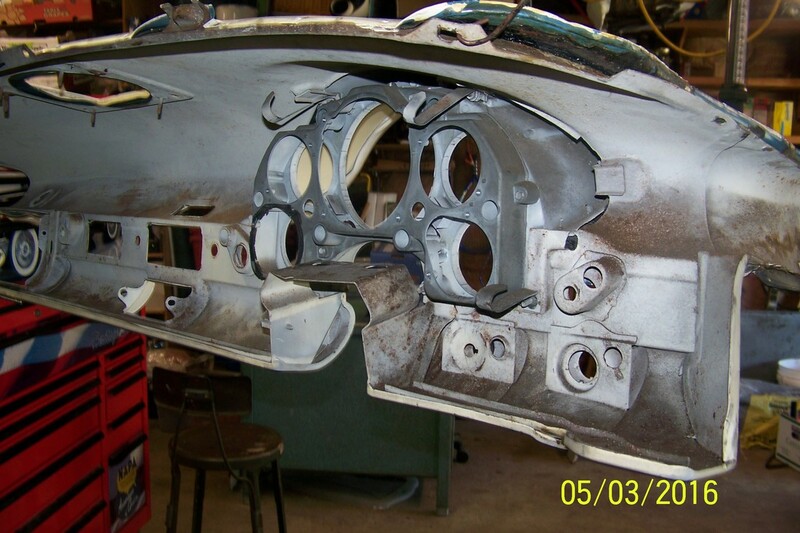 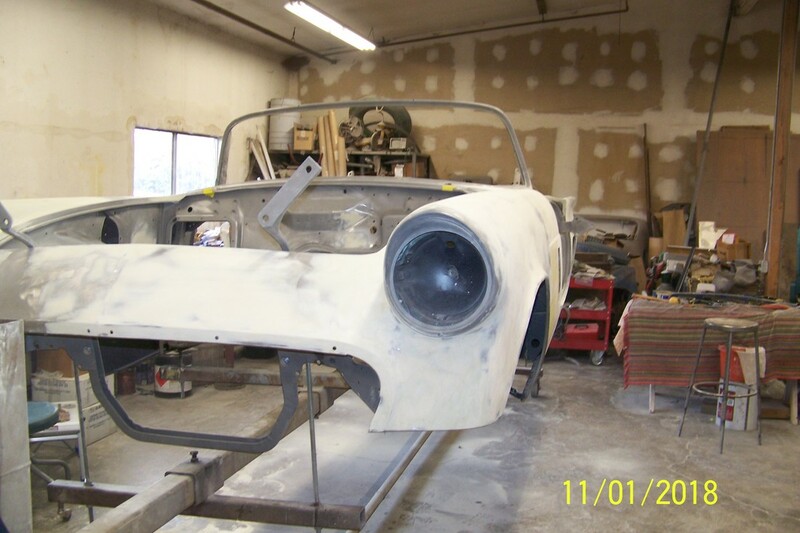 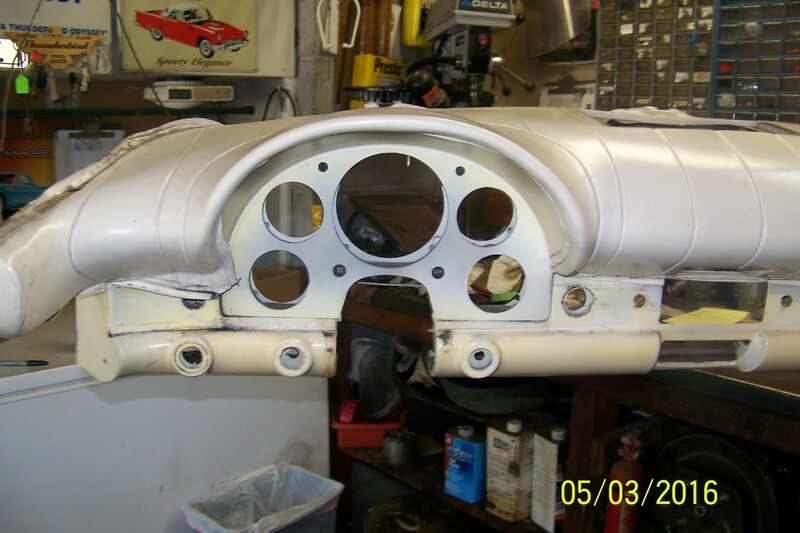 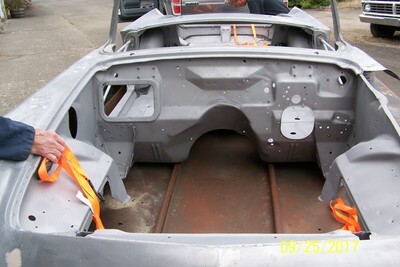 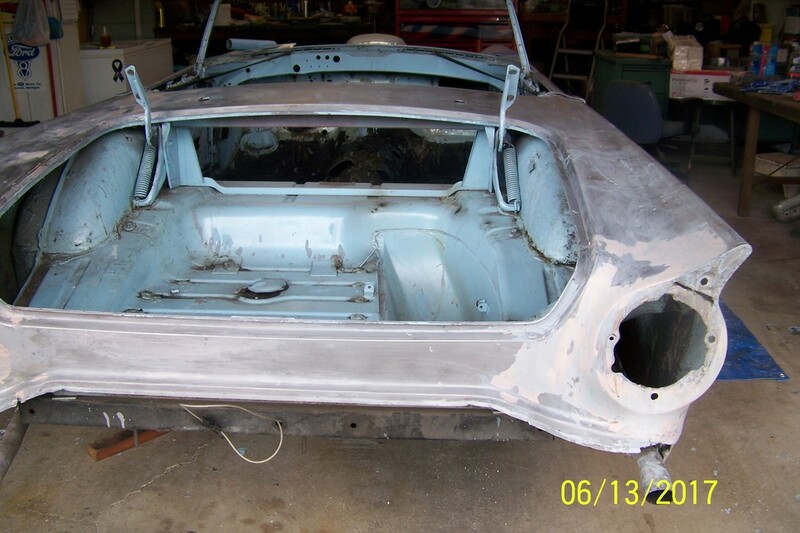 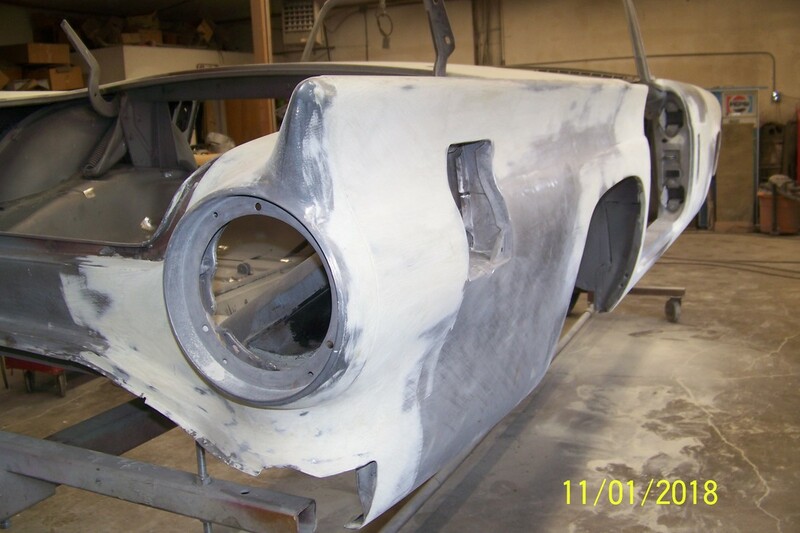 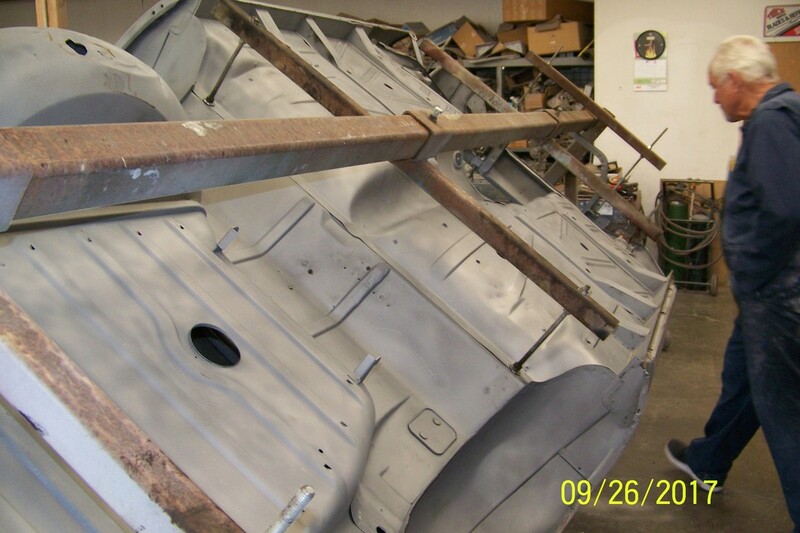 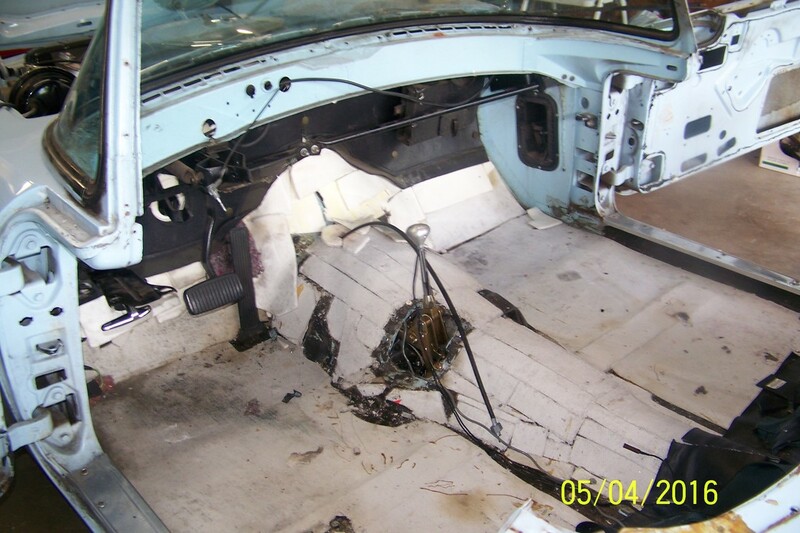 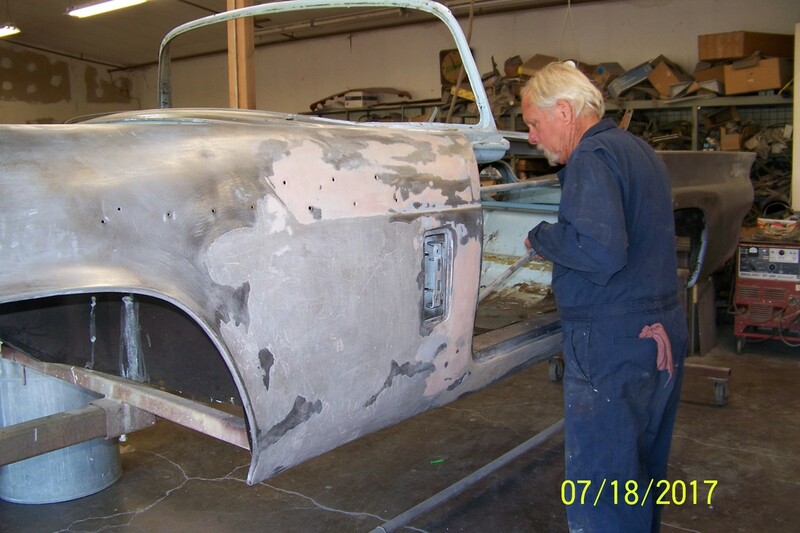 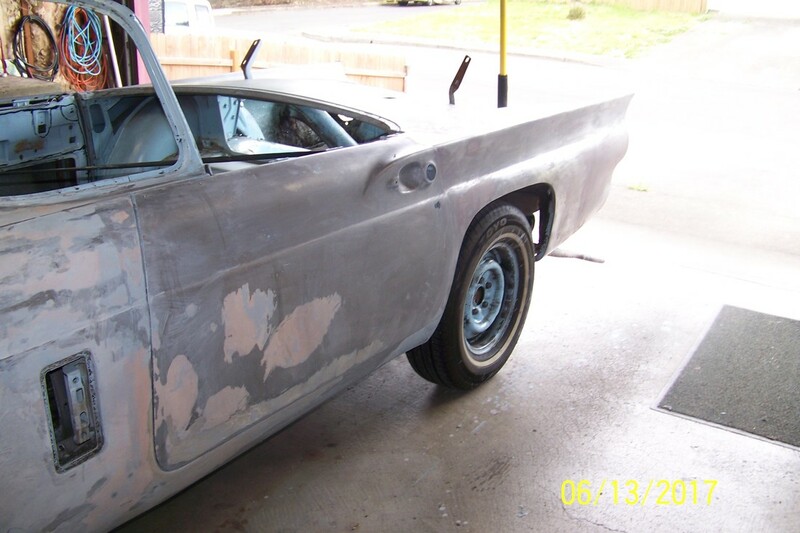 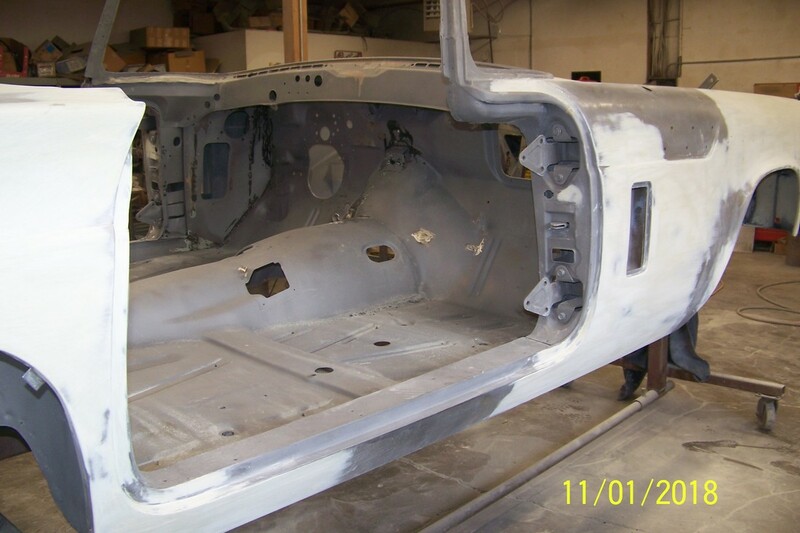 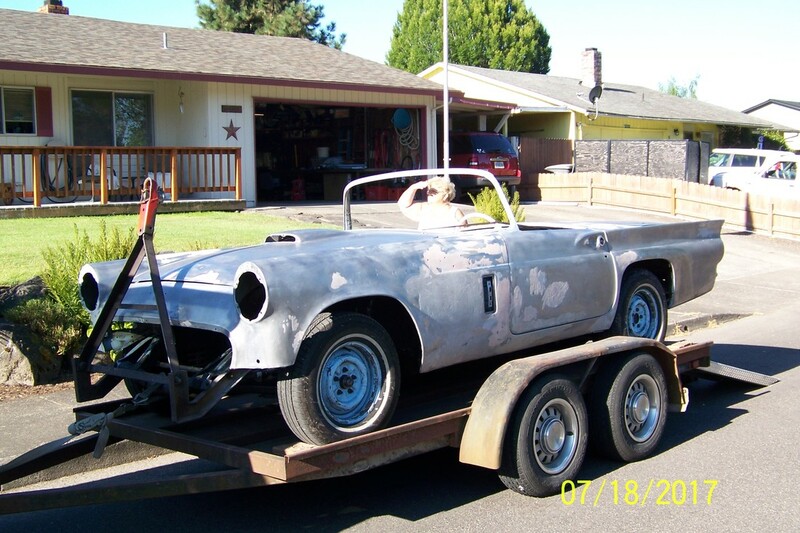 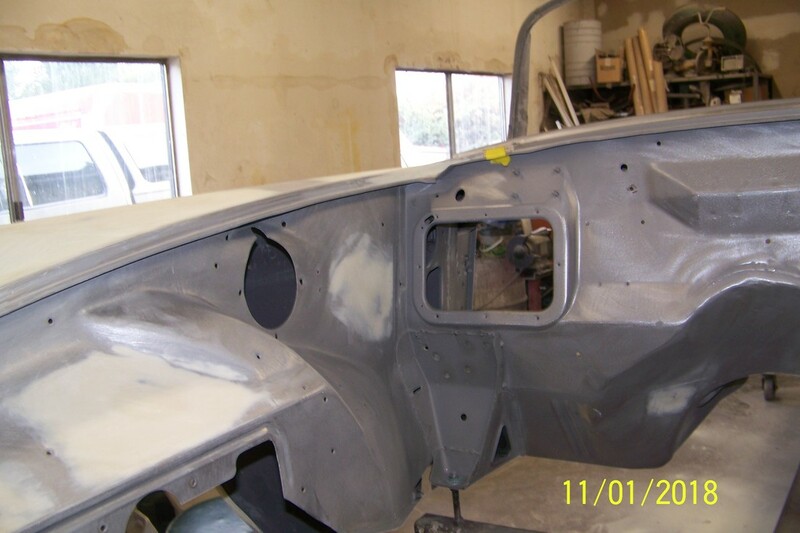 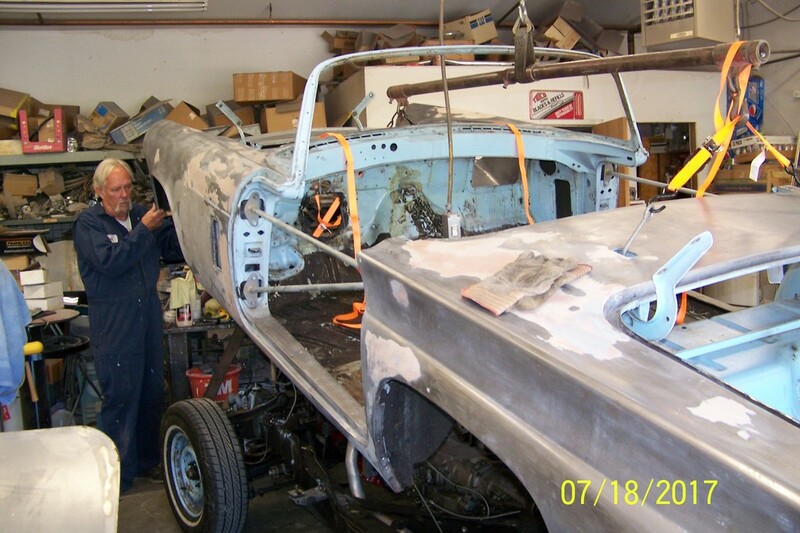 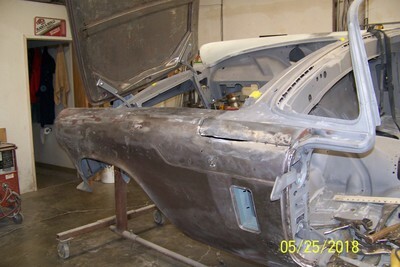 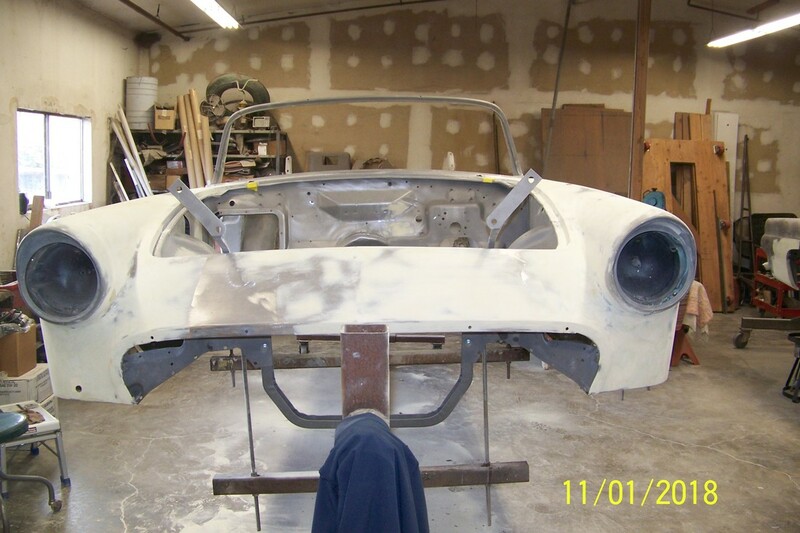 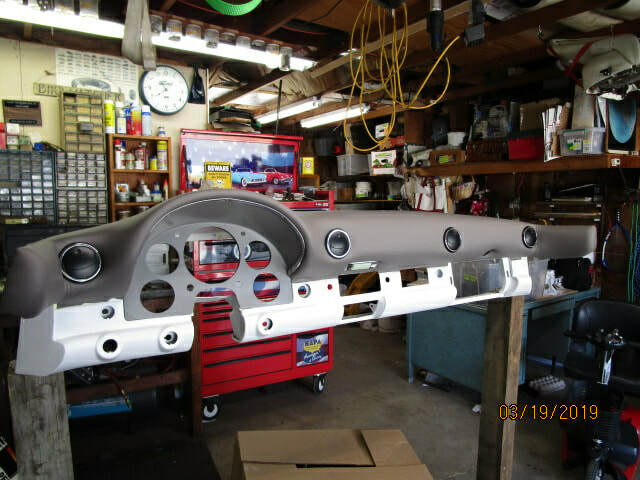 We are adding this page to show the complete body-off-the-frame restoration of a 1957 Thunderbird that your web-experimenter is going through. With the permission of our club president I am posting photos of the project as I proceed. New text and photos will be added at the beginning of the page occasionally. 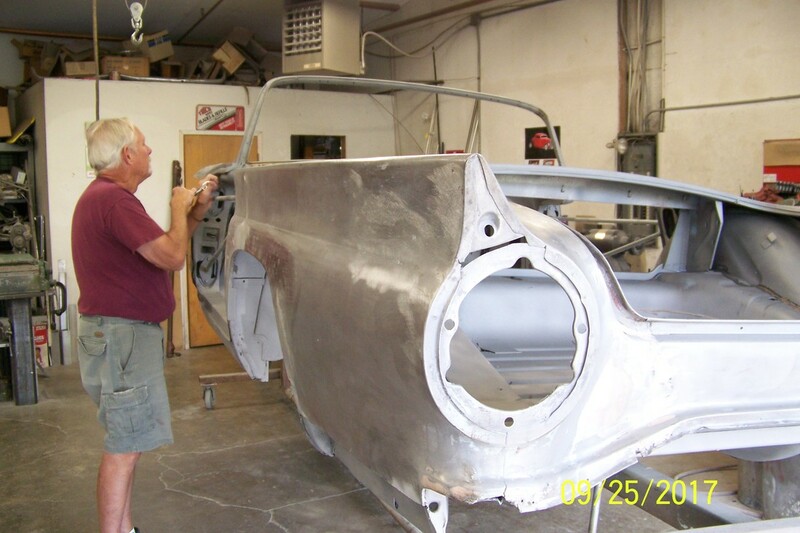 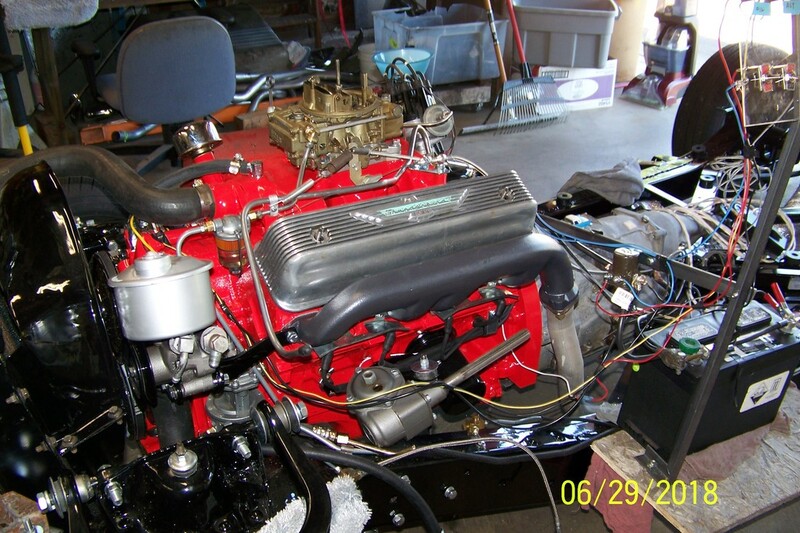 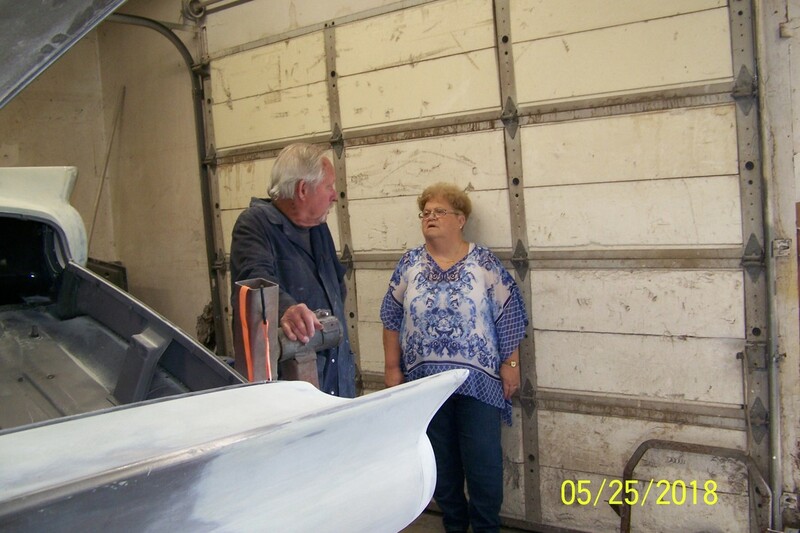 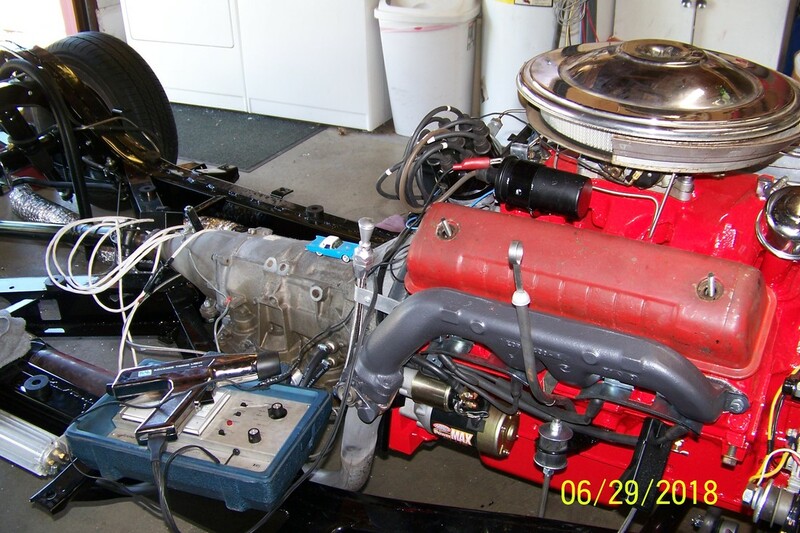 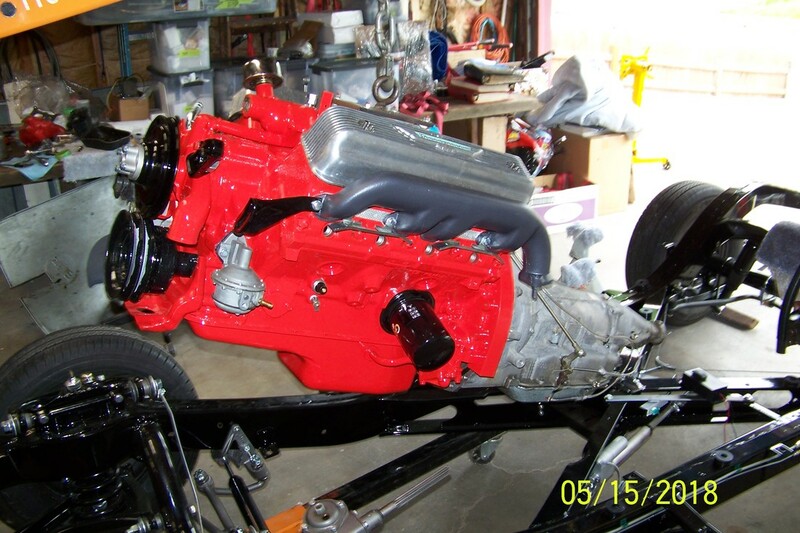 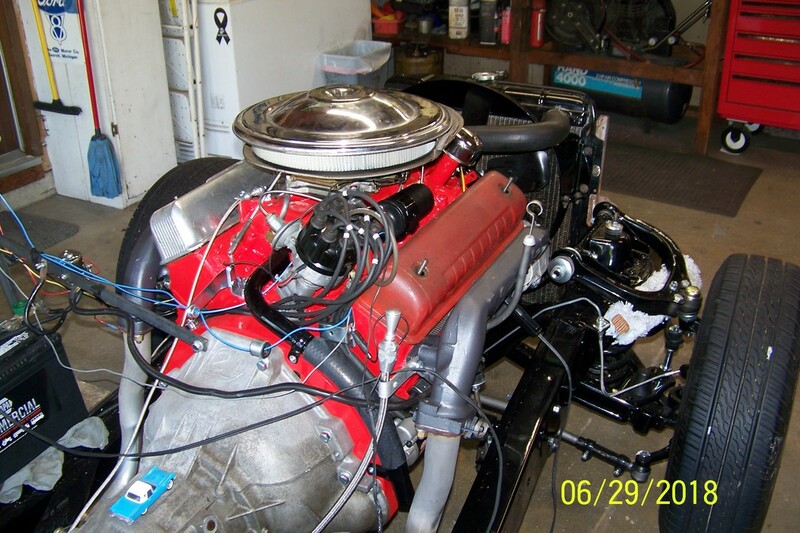 The project started in April of 2017 which was 47 years after having done a similar project on the same car. 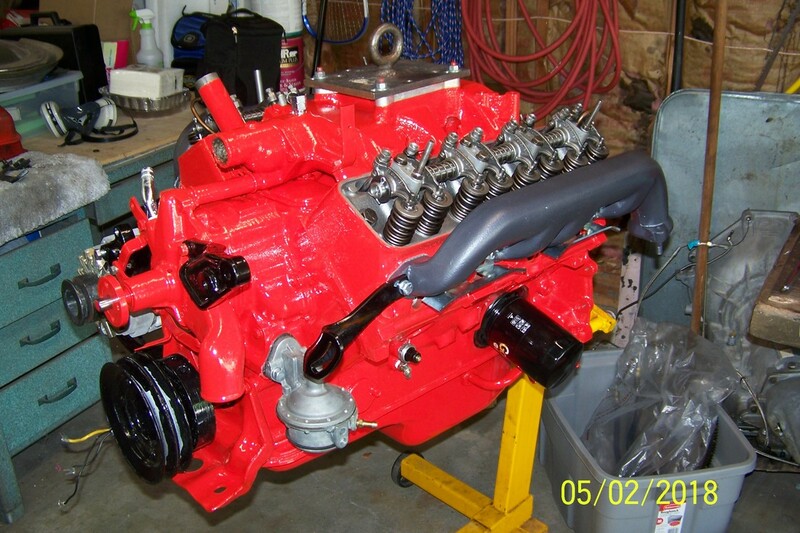 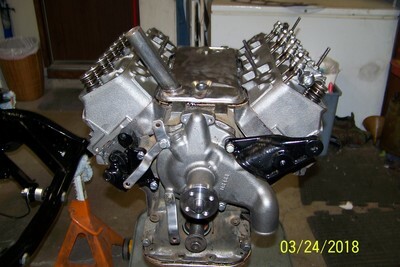 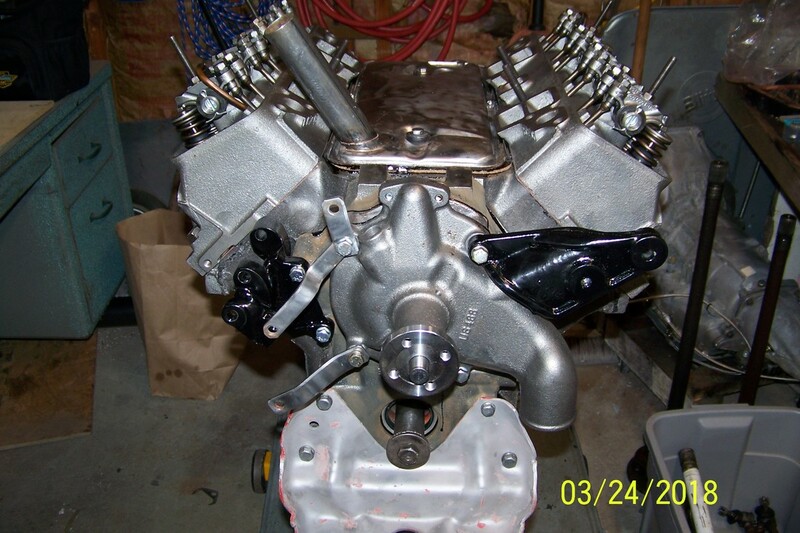 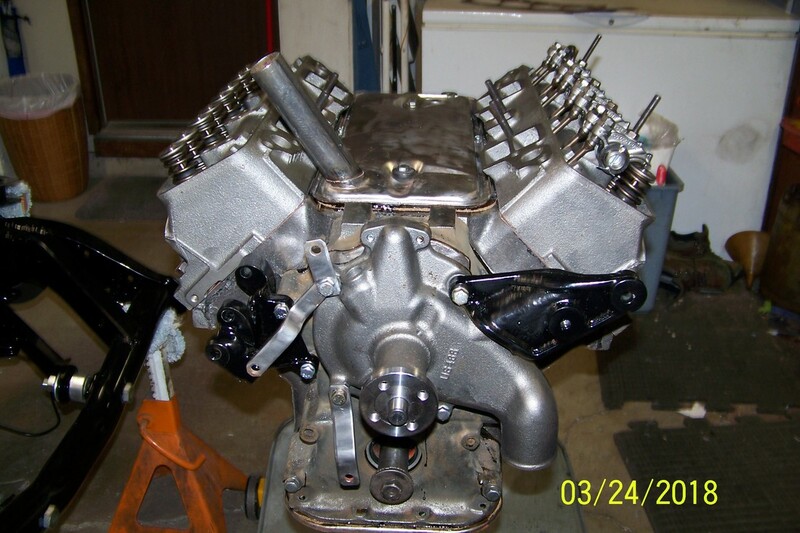 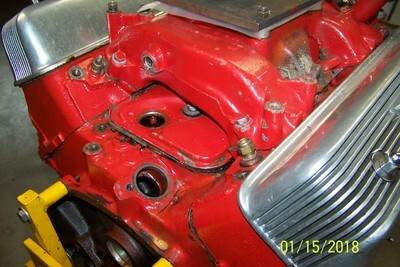 The engine rebuild below was done 50 years after its only other rebuild in 1967. Enjoy the progress and suffer some of my frustrations as I proceed. 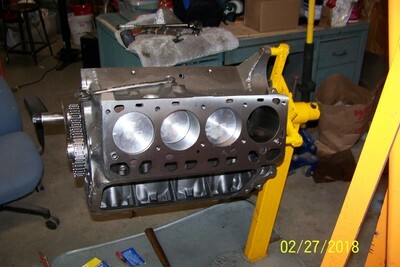 So start near the bottom of this page and watch the progress going up. 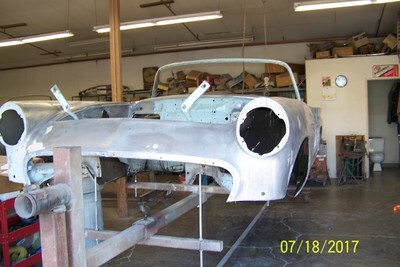 Winter has come and gone and we are still working on the body. 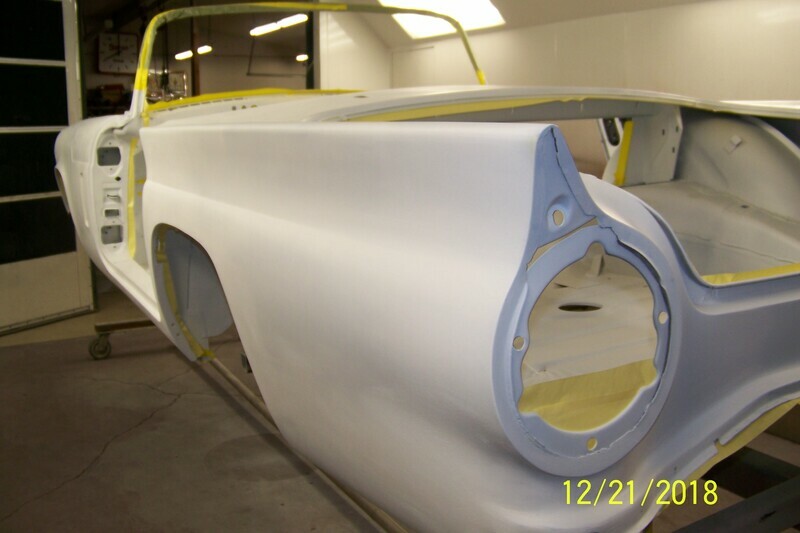 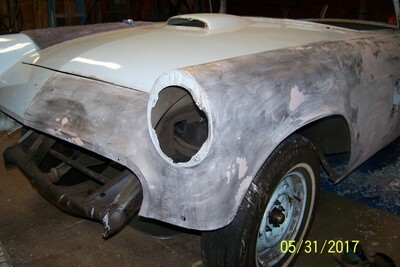 All of the body work is now complete, several coats of primer have been applied and sanded. 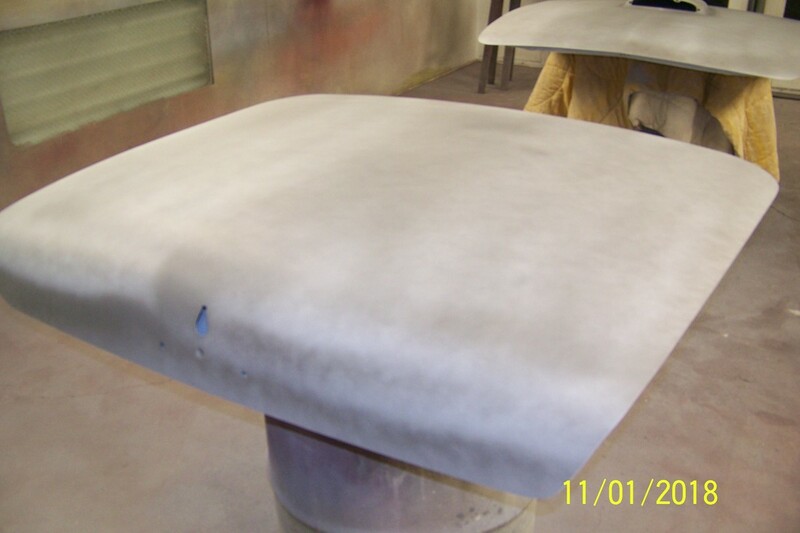 We are at the point of spraying on Lizard Skin which acts as a sound deadener and heat block. 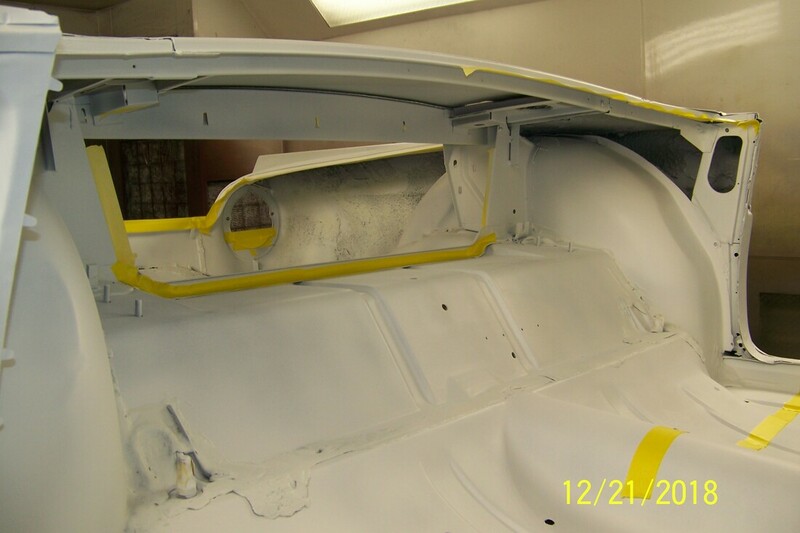 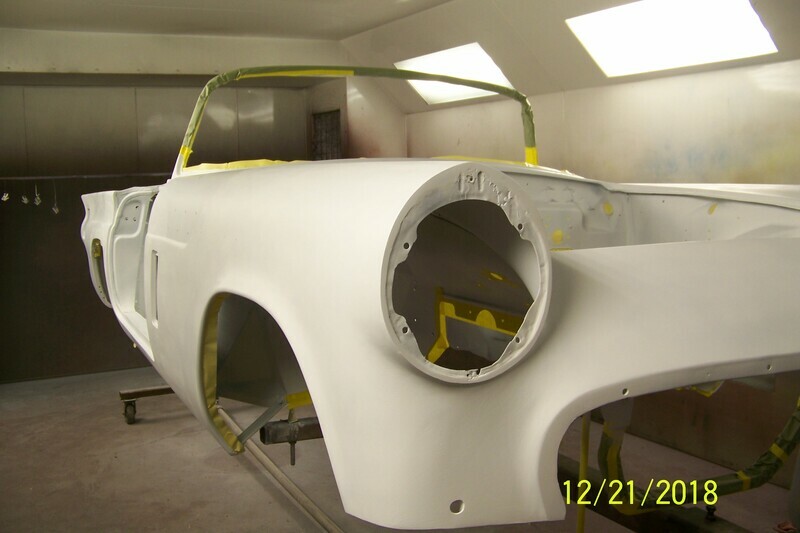 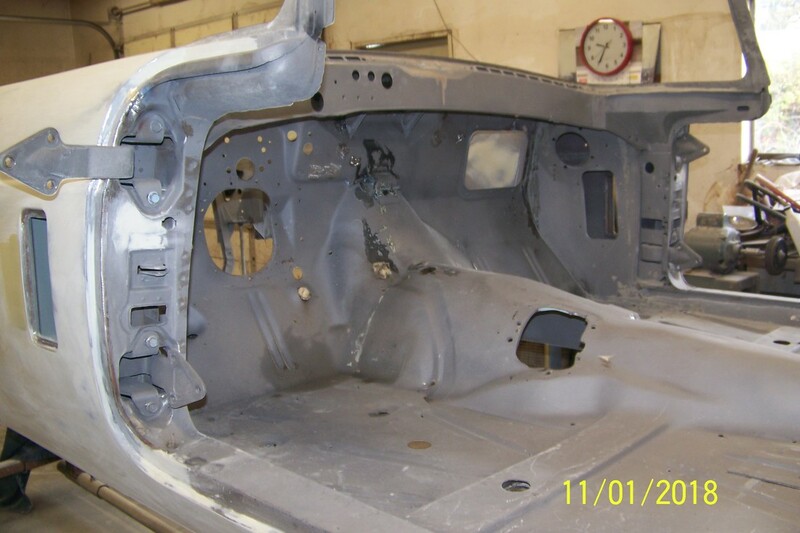 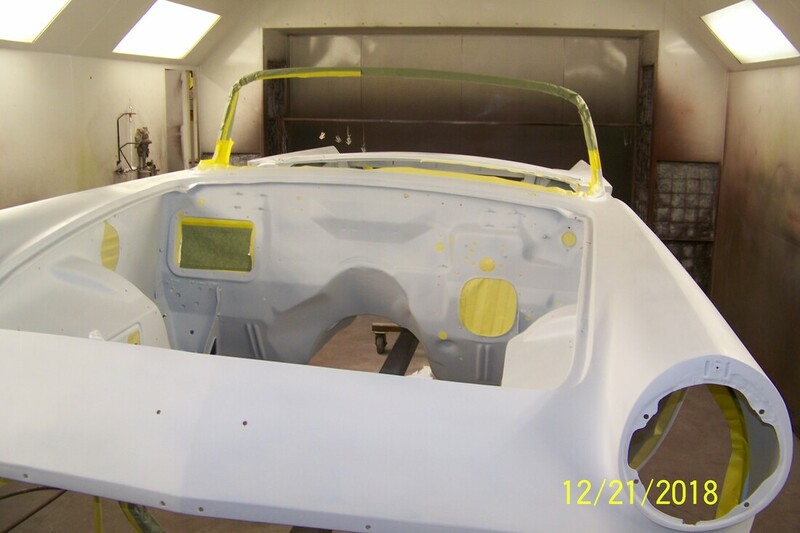 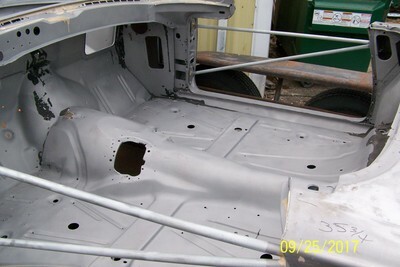 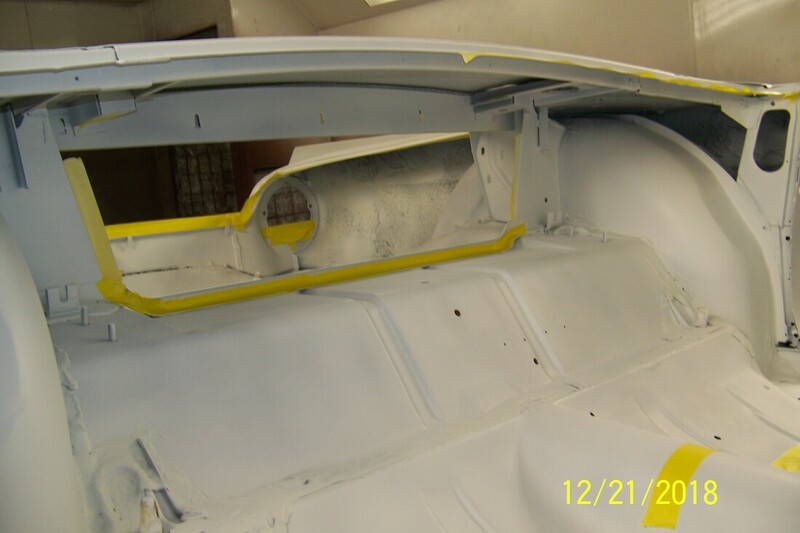 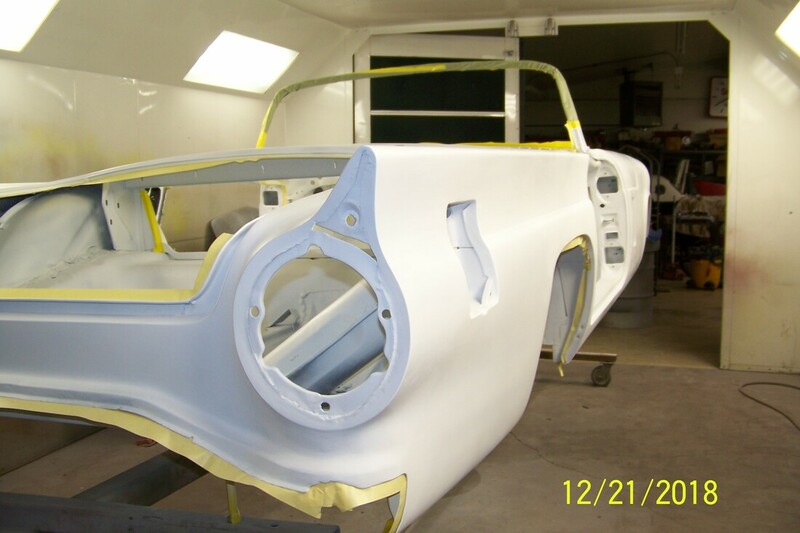 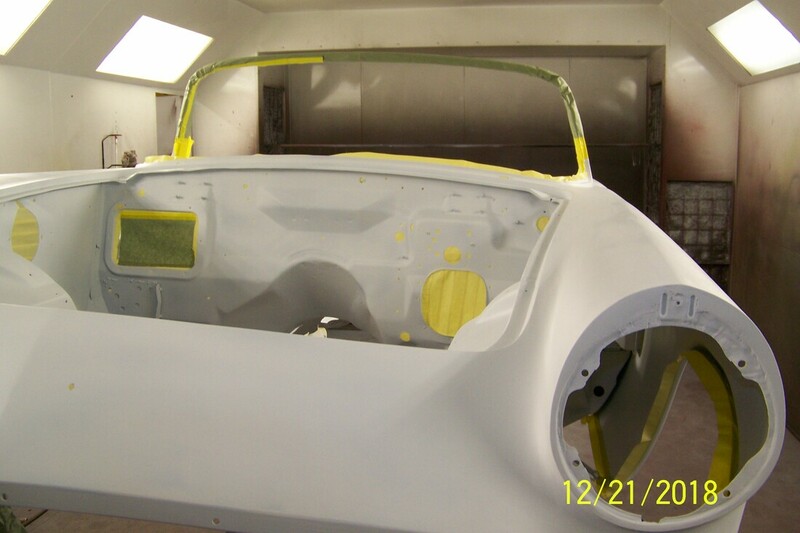 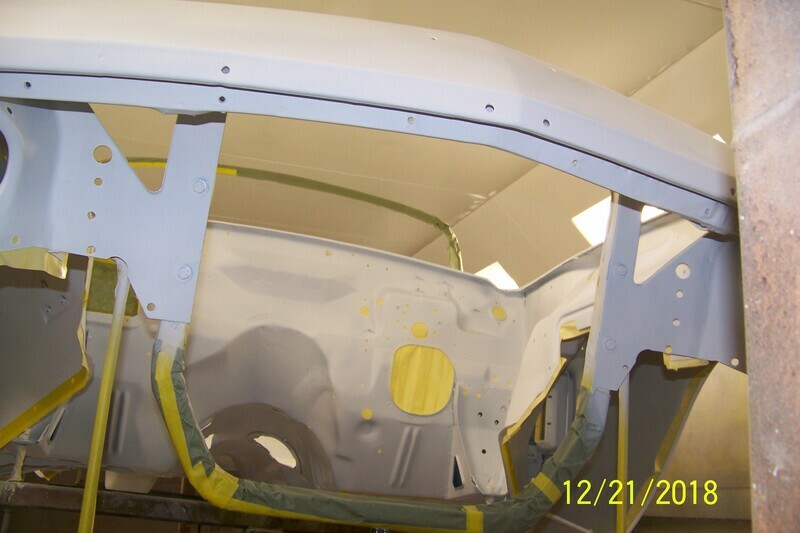 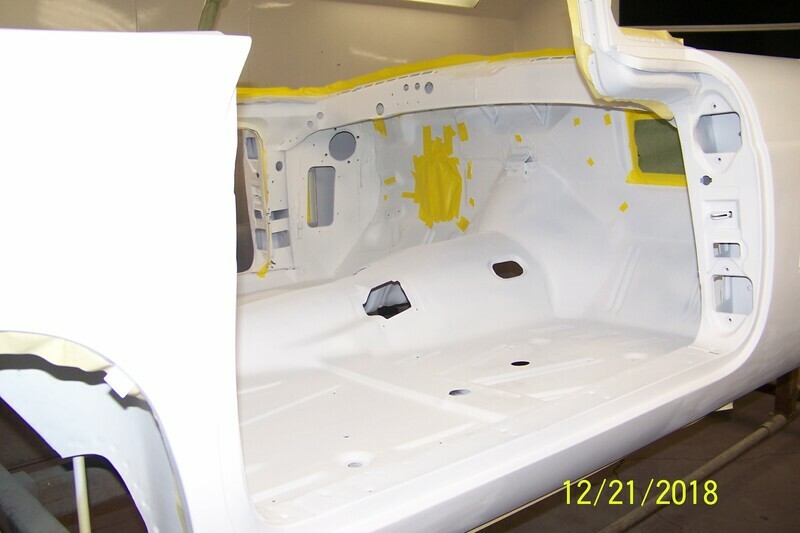 After that it will be ready to put color on the bottom of the body, trunk, passenger area, and engine compartment. 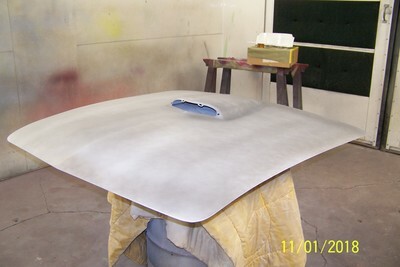 Once that is set it will be clear coated, sanded and buffed. 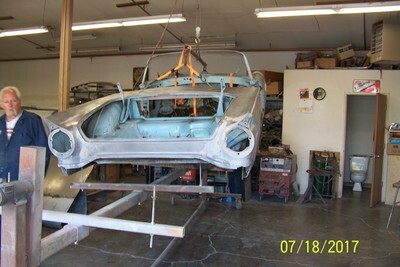 Then the body will go on the frame. At one point I asked Dave if this was the worst body he has worked on to bring back to original condition and he replied "probably so". 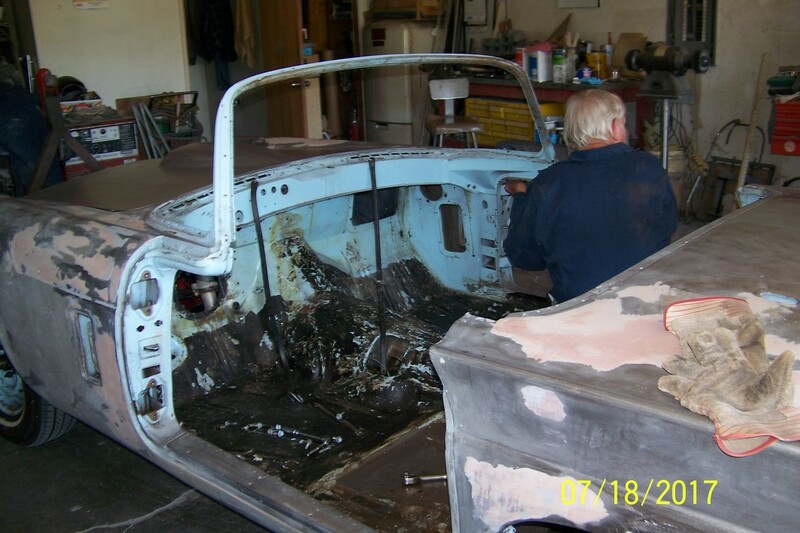 Even though I've owned the car since 1966 and driven it hundreds of thousands of miles I did not know (nor did Dave) how bad the body was until we got into it. 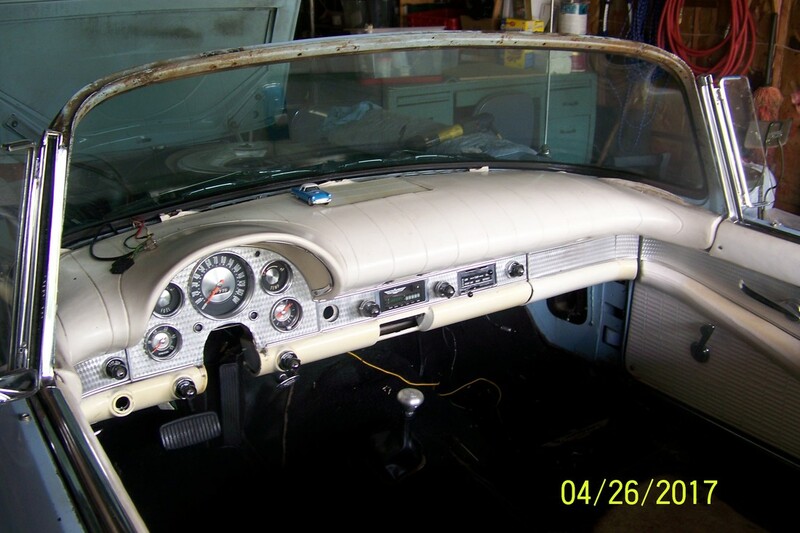 I took my dash to an upholsterer back in November and finally got it on March 19th. 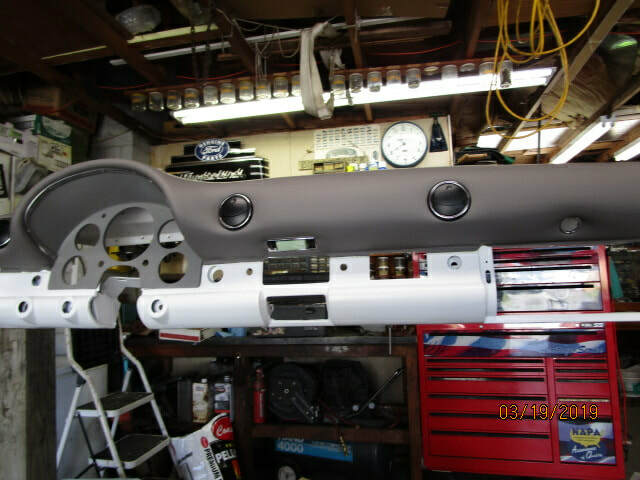 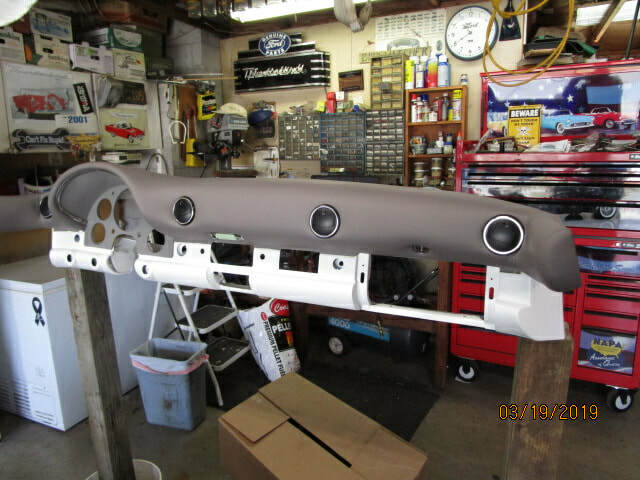 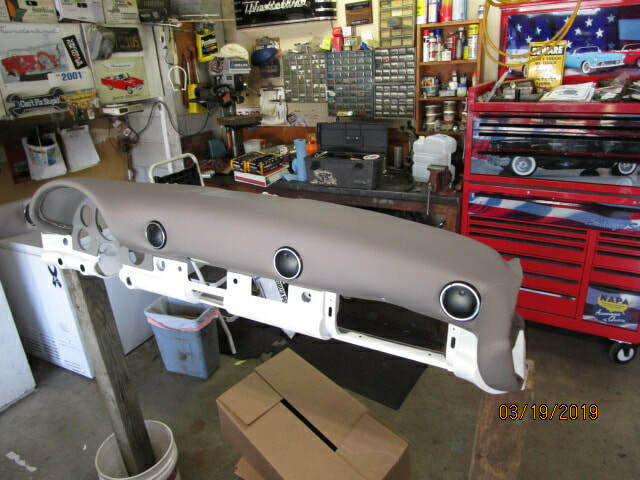 It is ready for Dave to put the textured paint on the lower section and then I can start assembly work on the dash. You can see the four AC vent outlets we have added. 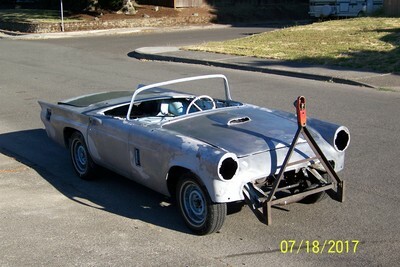 I admittedly got the idea for this from Jerry Sharp's car. The next set of photos bring us up-to-date. Dave has been making steady progress on my car's body. 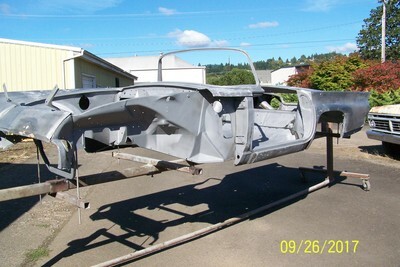 He has been delayed working on another long-term project and we missed the September-October target date for getting the body painted and back on the frame. 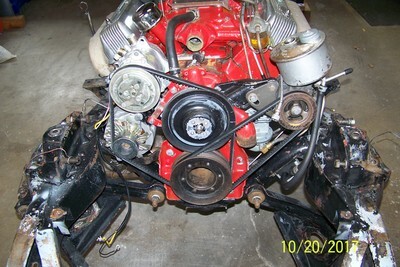 Below are nine photos I took on November 1st. 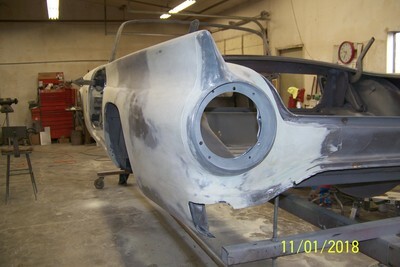 From these you can see that he is in the final stages of sanding. The primer will be coming very soon. 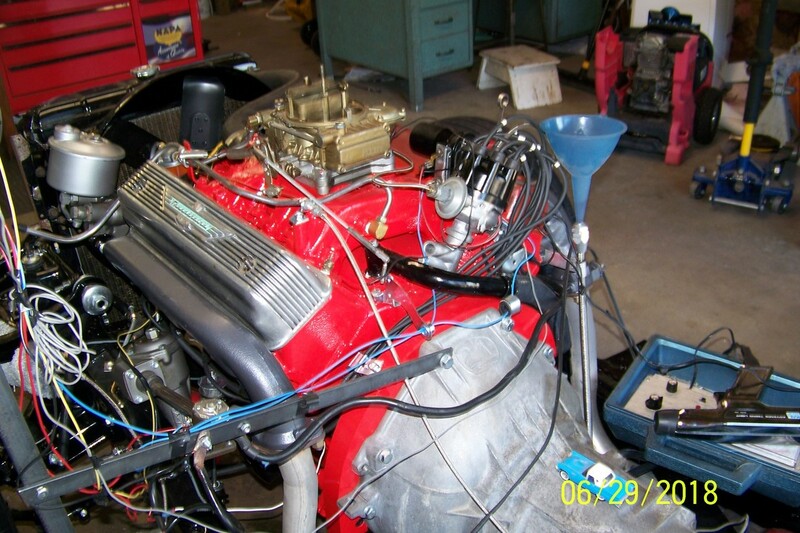 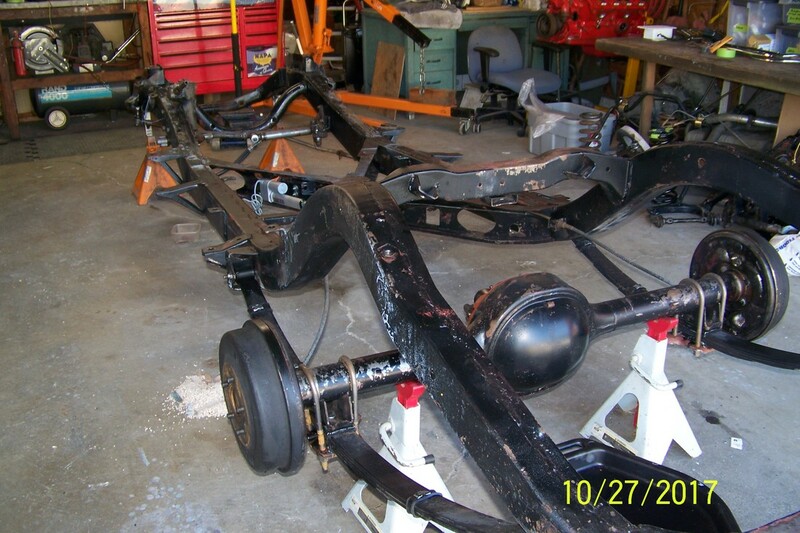 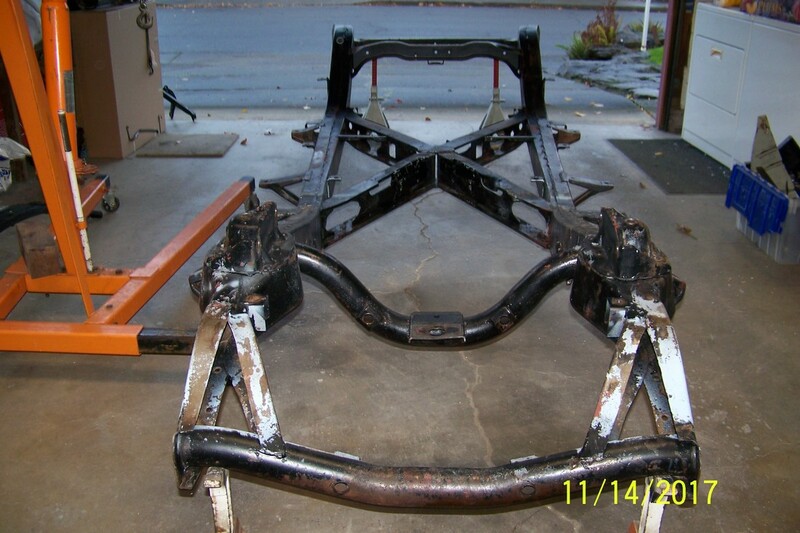 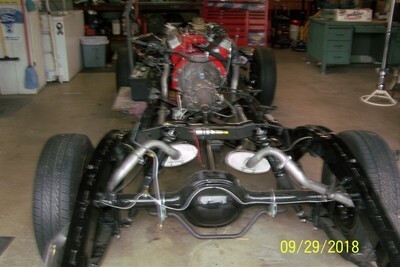 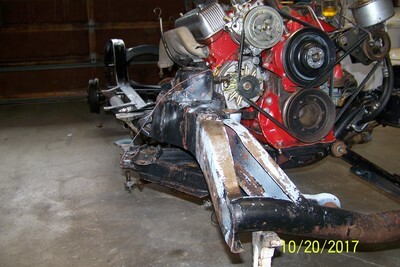 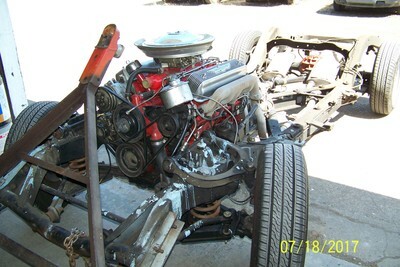 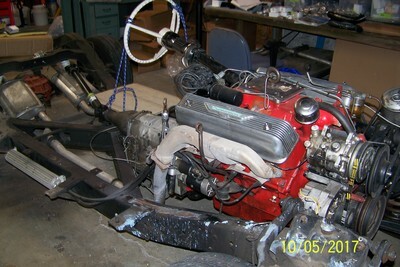 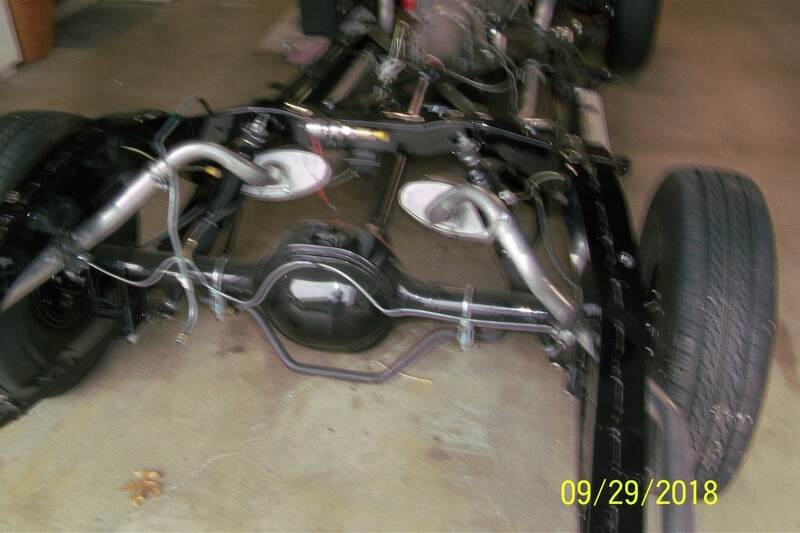 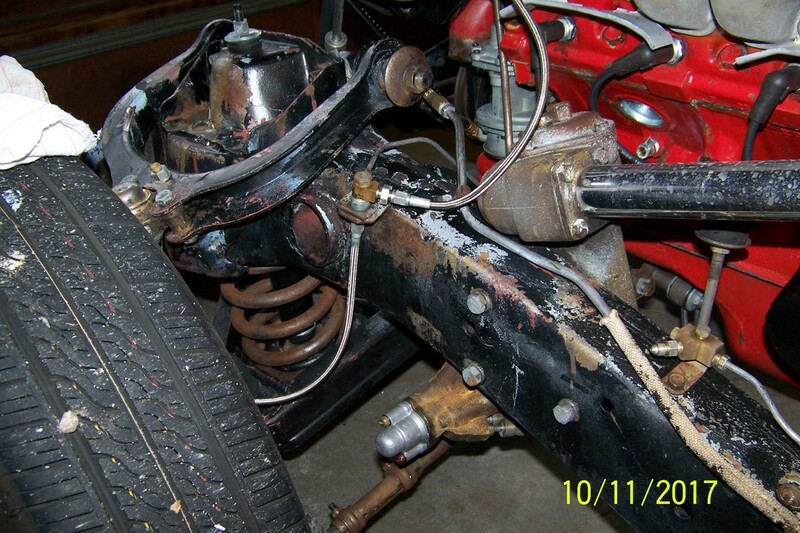 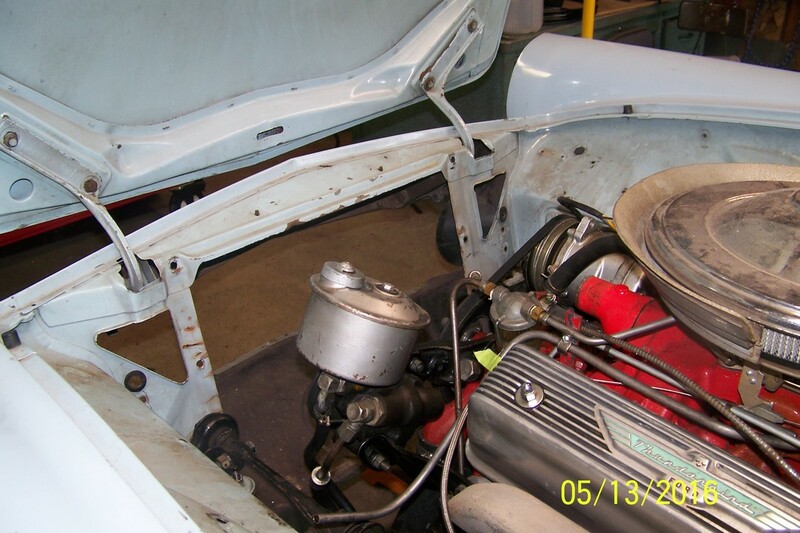 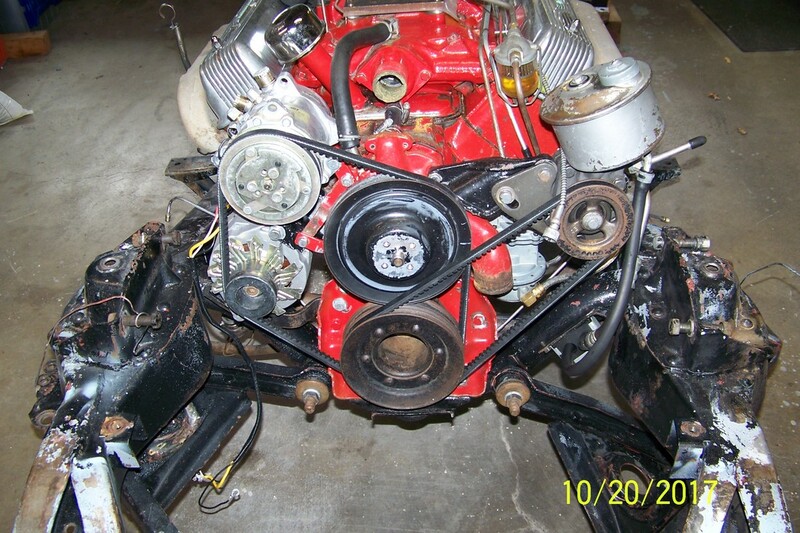 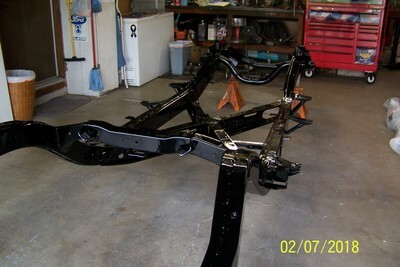 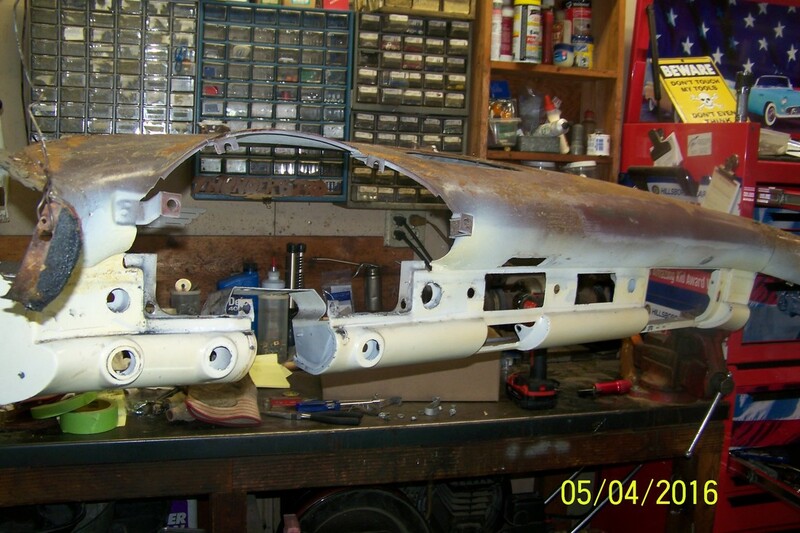 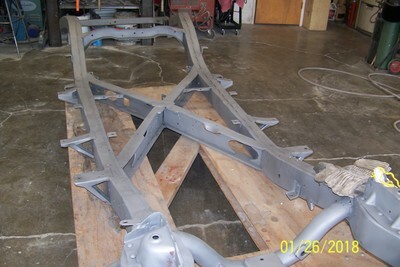 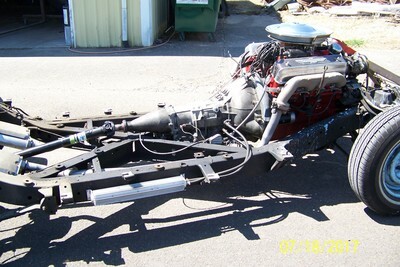 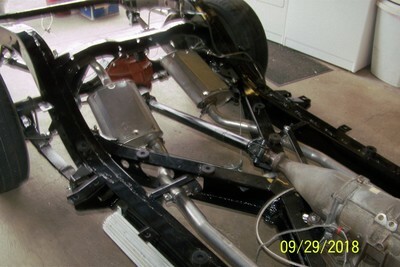 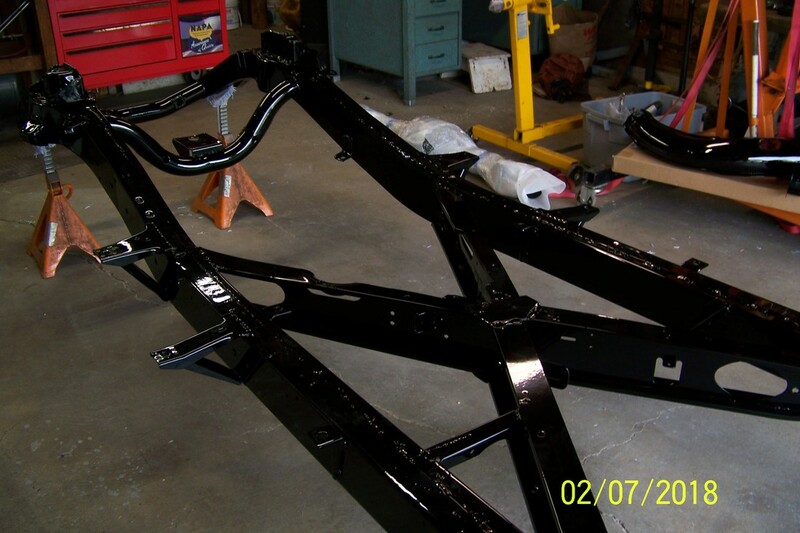 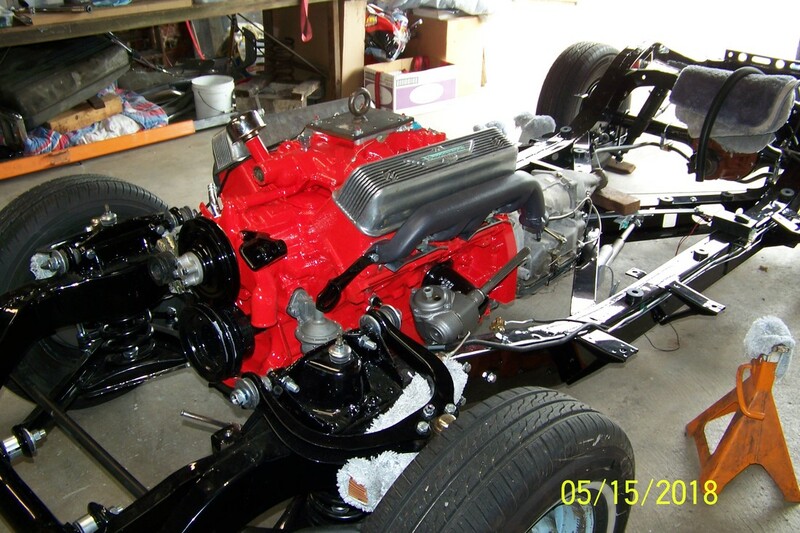 The photos below show the completed frame/suspension/engine waiting on the body. 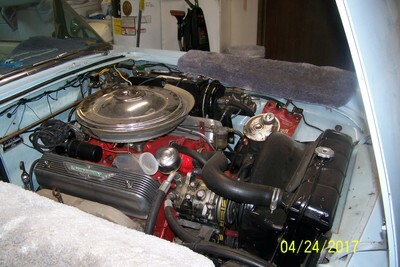 I've been starting and running the engine for several months now. 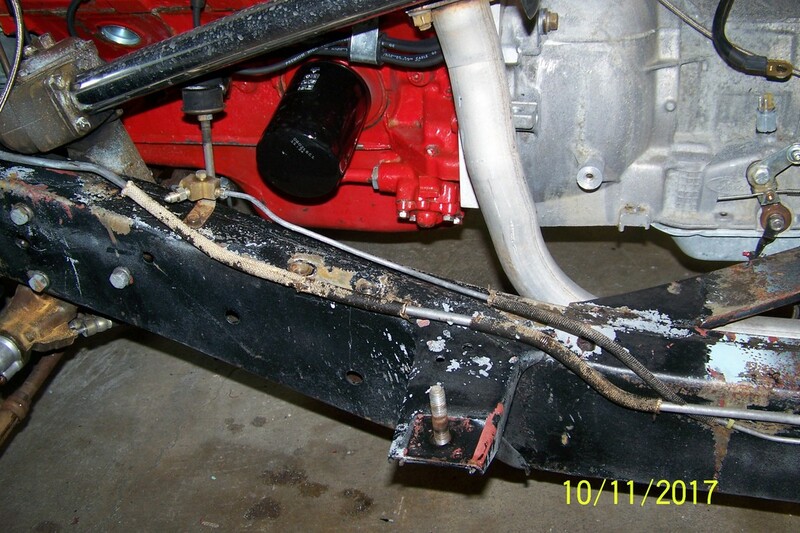 I initially started it with a real dubious (read Mickey Mouse) exhaust system. 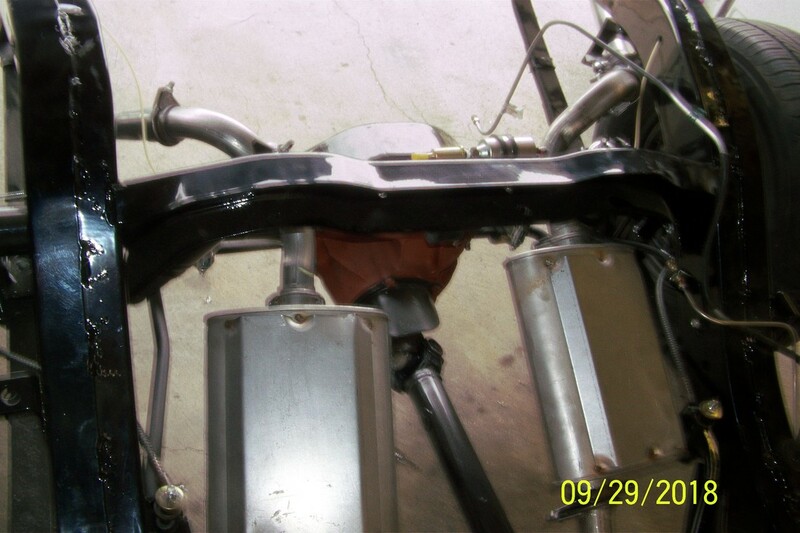 I didn't want to blast everyone in the neighborhood out with the noise so I picked up a couple of blown out glass-pack mufflers at an exhaust shop and shoved them onto the pipes coming off the engine. 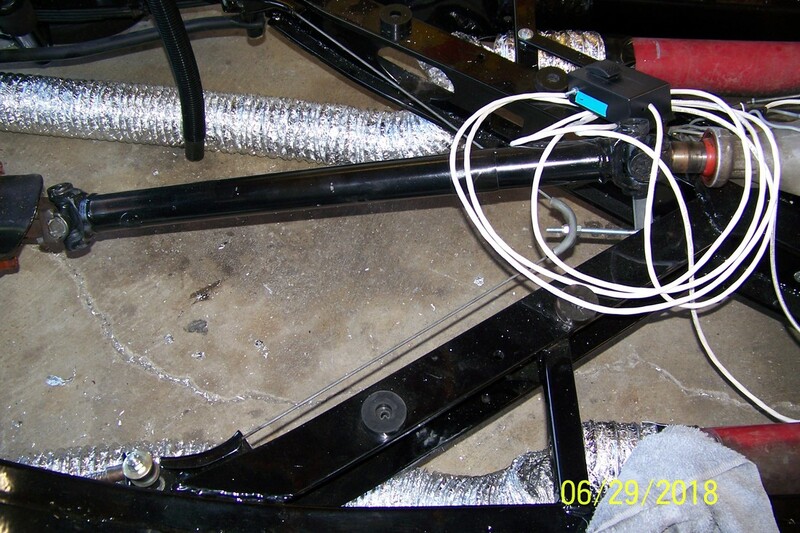 To them I added about 8' of drier vent tube to get the exhaust fumes out of the garage. You may see that in these photos. The complete exhaust system is now in place. You can also see a "dashboard" I made with an on/off and start switches plus a temperature gauge and ALT & OIL lights. This makes it easy to start the engine and to watch the temperature and other vital signs. The engine runs very nicely; however, it had a miss that was a bit difficult to track down. 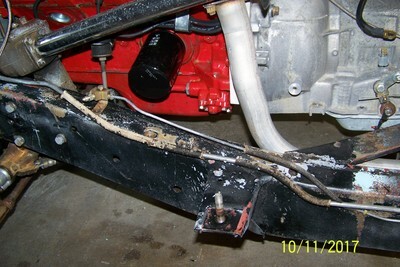 I finally found internal parts in the distributor had become stuck while sitting on the shelf for 18 months. 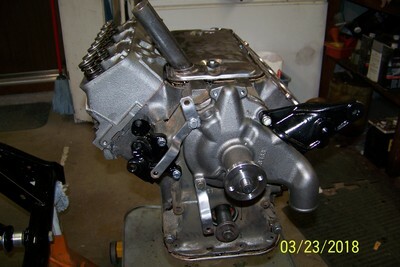 A few hours of disassembly, cleaning, lubricating and reassembly took care of that. 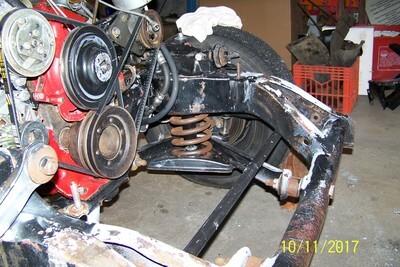 I have also lifted the rear wheels off the ground and run the transmission through its gears. 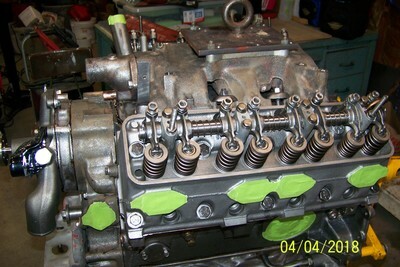 All seems to be working well. Part way through the photos you will see the quality of the photo go to pot. Something is wrong with my camera and I'm probably going to have to replace it. 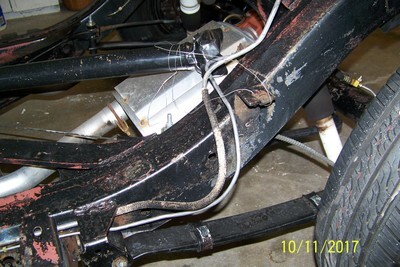 There is a coil of white wiring showing in one photo - that goes to a control box to set and release the parking brake. 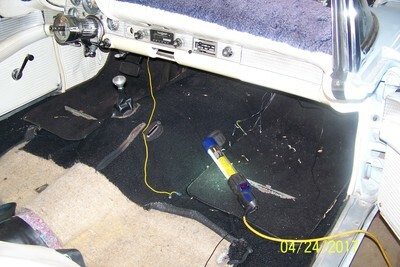 I am replacing the under-dash pull with a switch to set and release the brake. 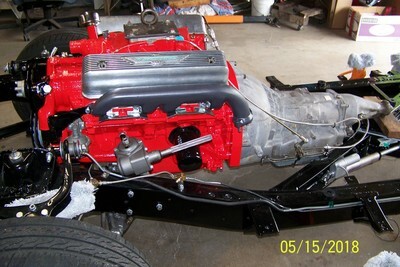 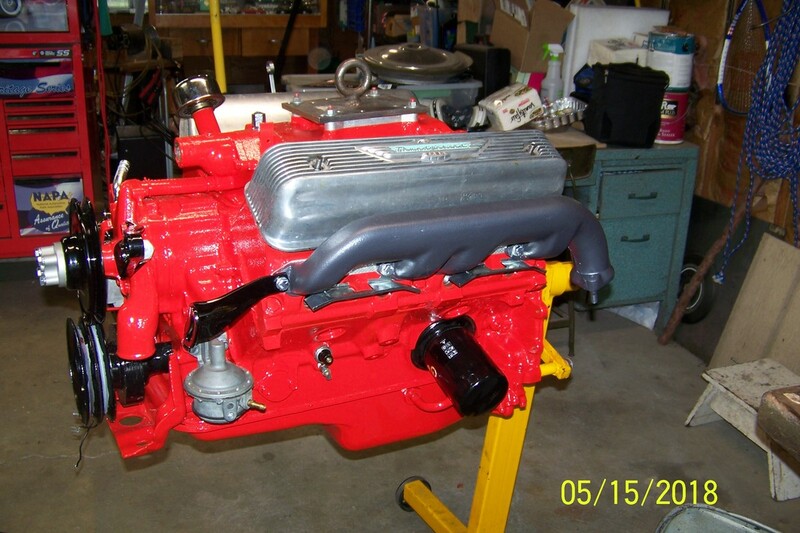 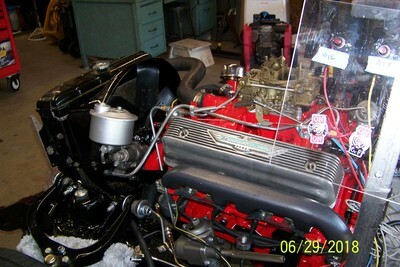 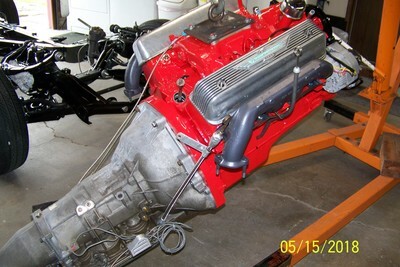 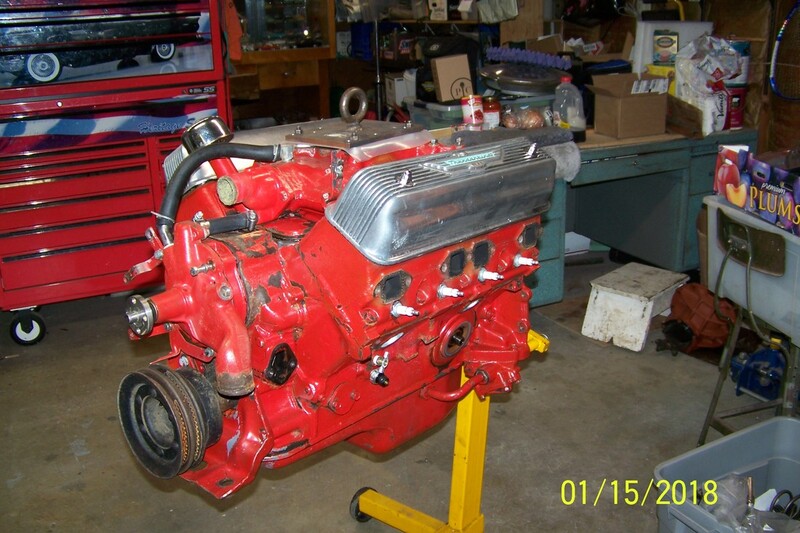 The ugly red valve covers will be replaced with my original finned aluminum ones when we get closer to completion. I have also received all of my upholstery. 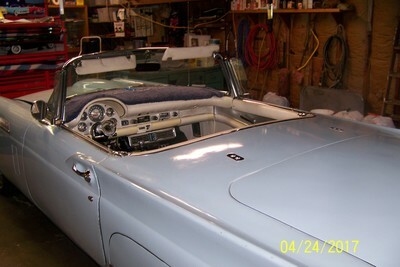 Most Starmist Blue 1957 Thunderbirds had a two tone blue interior, mine was a much less common all white. 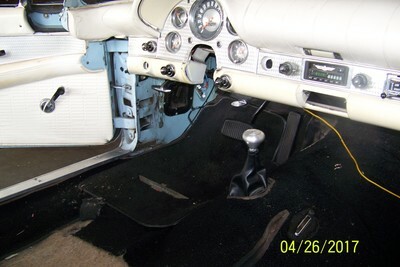 Even though we like the white interior it is too hard to maintain so we elected to change the interior. 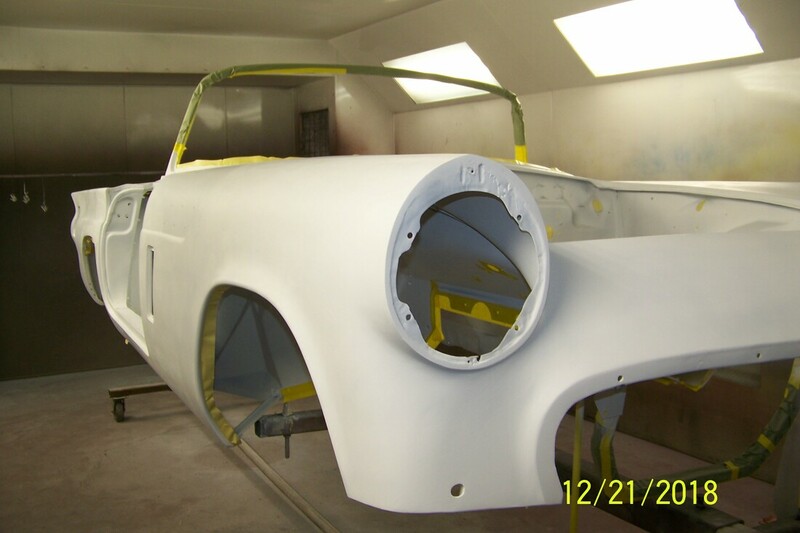 It is going to be a medium and light gray. 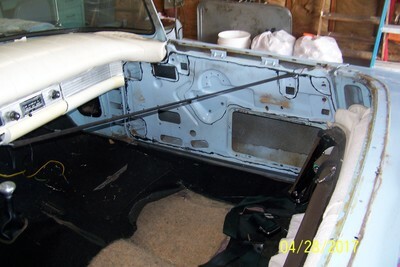 I purchased the material here locally and sent it to Larry's Thunderbird in California where they made it into upholstery for me, including having the door and kick panels heat stamped with the Thunderbird logo as the original was. 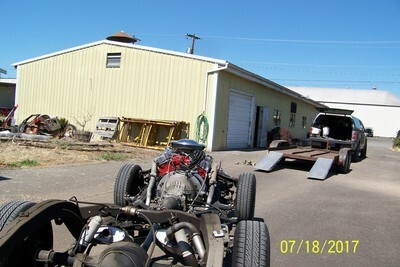 It all looks very nice but it is all still sitting in boxes in our spare bedroom. While I've been working on the engine and frame Dave has kept busy continuing the body work for us. 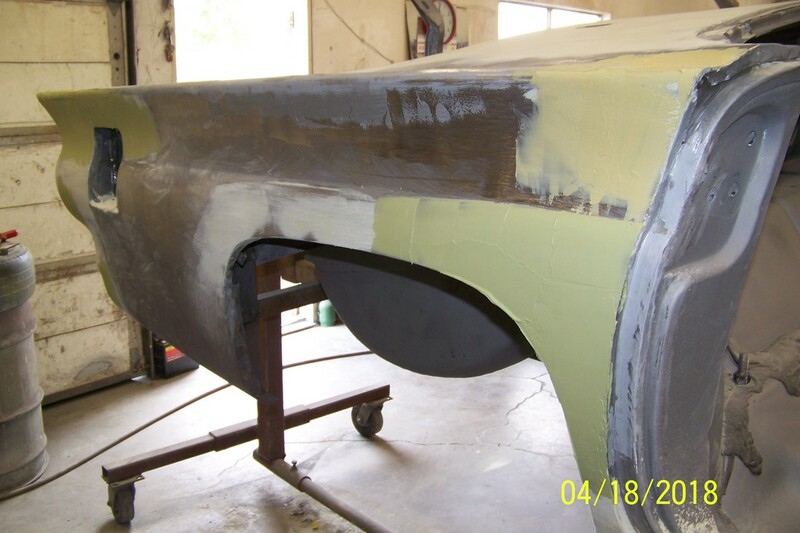 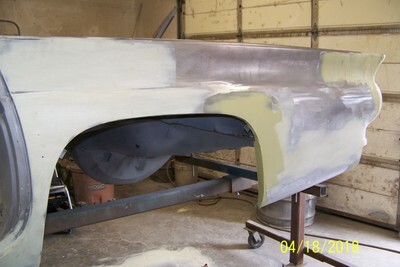 In these photos you can see both rear fenders and the left front fender are finally on the car and progress is being made. With any luck we can put the body back on the frame in late September or early October. 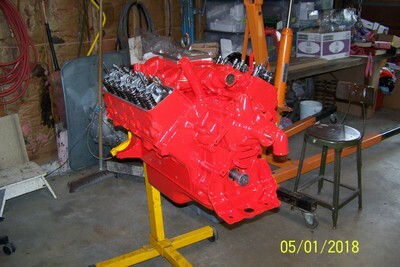 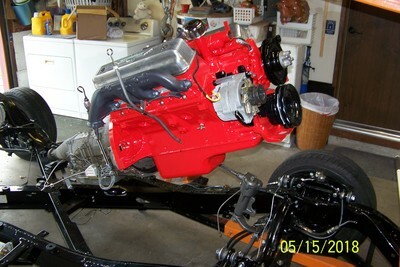 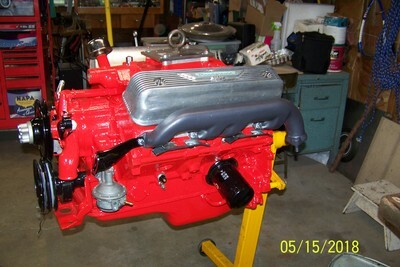 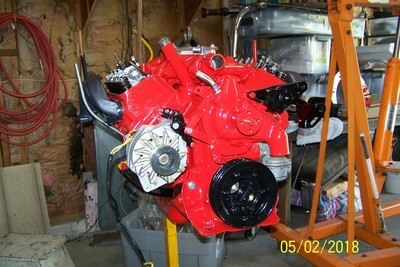 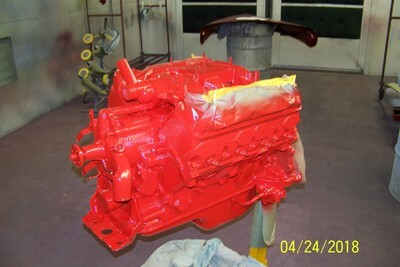 After engine assembly I took it to Dave Van Winkle to have it painted. 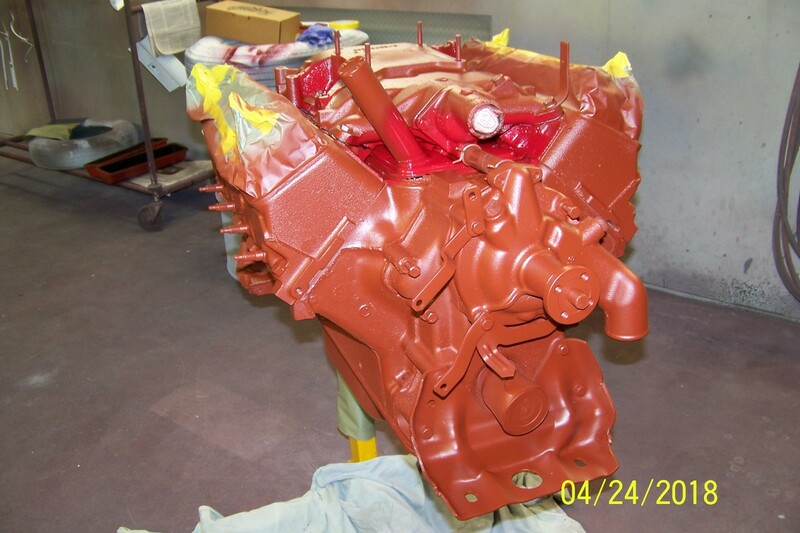 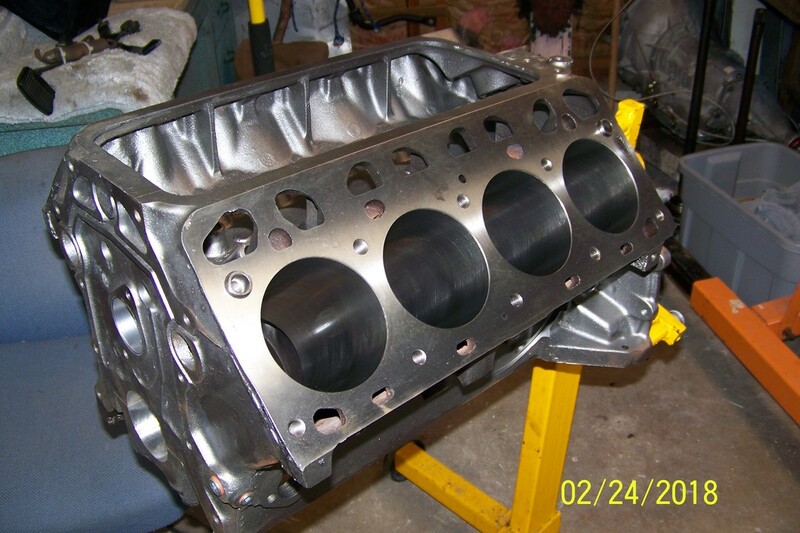 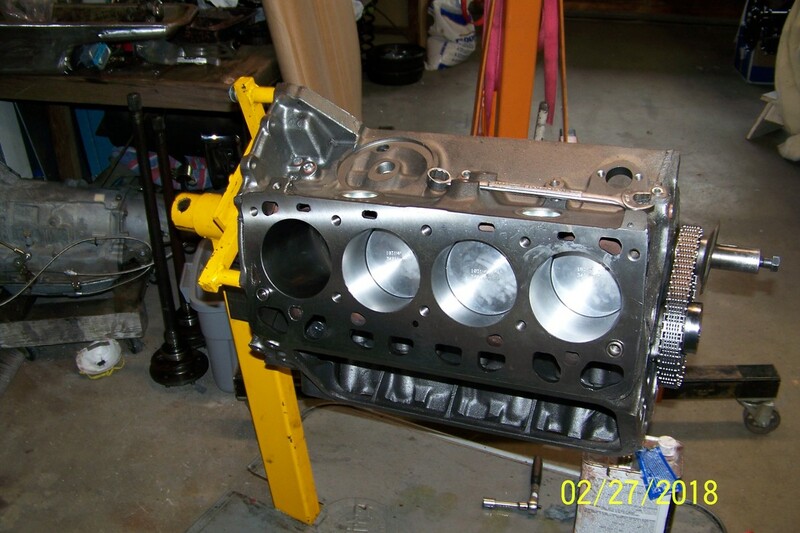 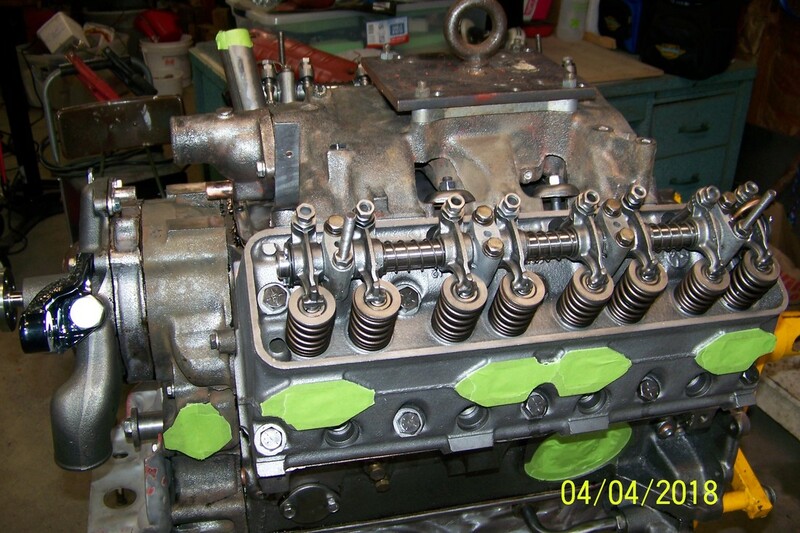 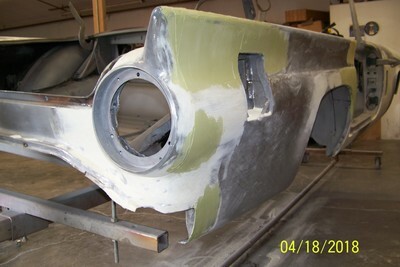 The photos below show the engine ready for paint, then in primer, and in final paint. 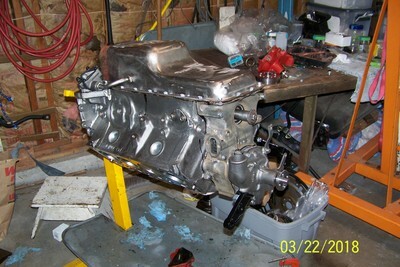 Following those are photos as I assembled the external parts on to the engine and then onto the frame. 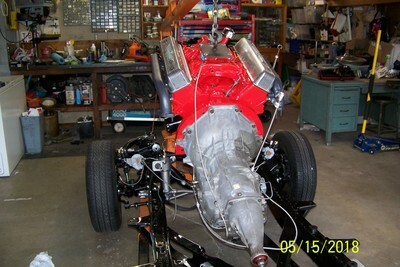 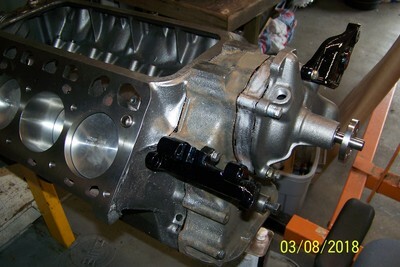 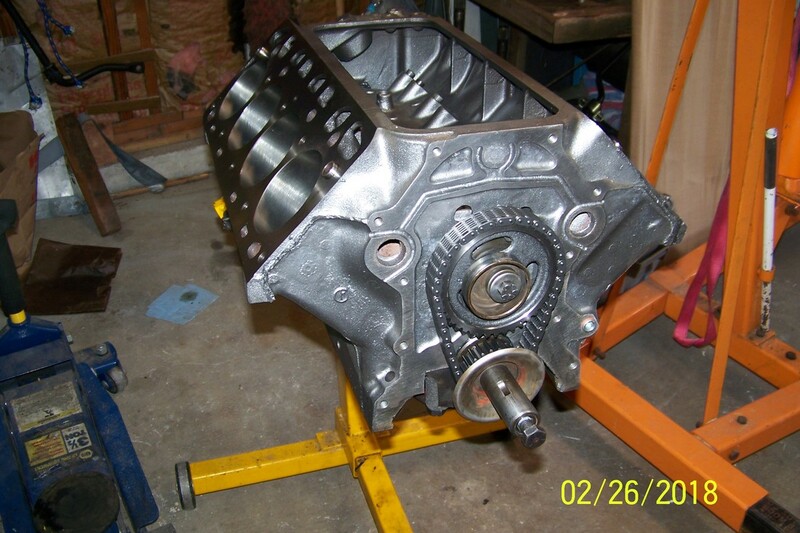 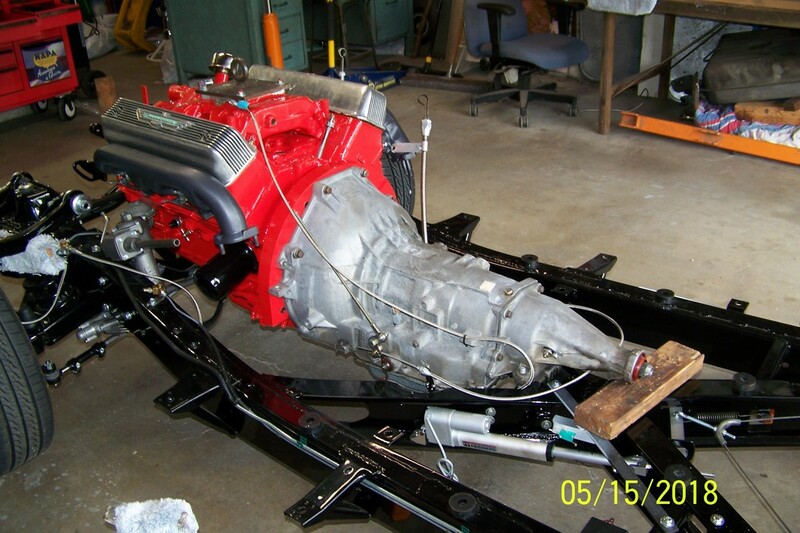 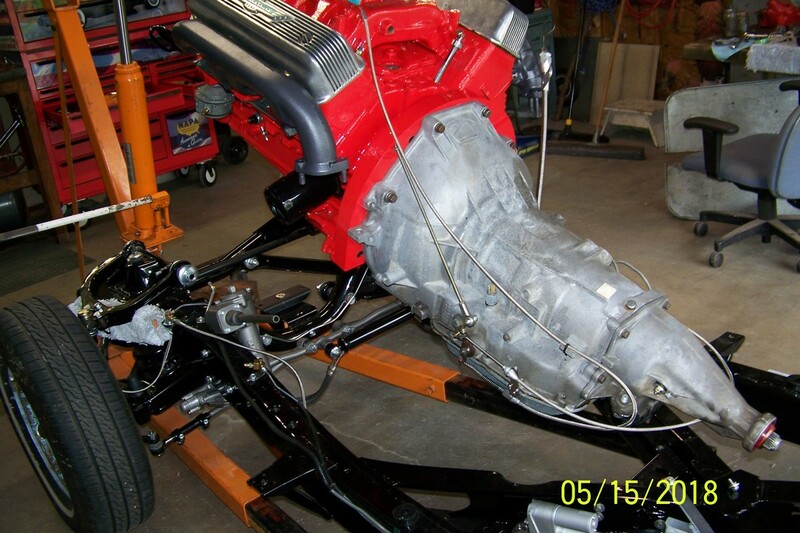 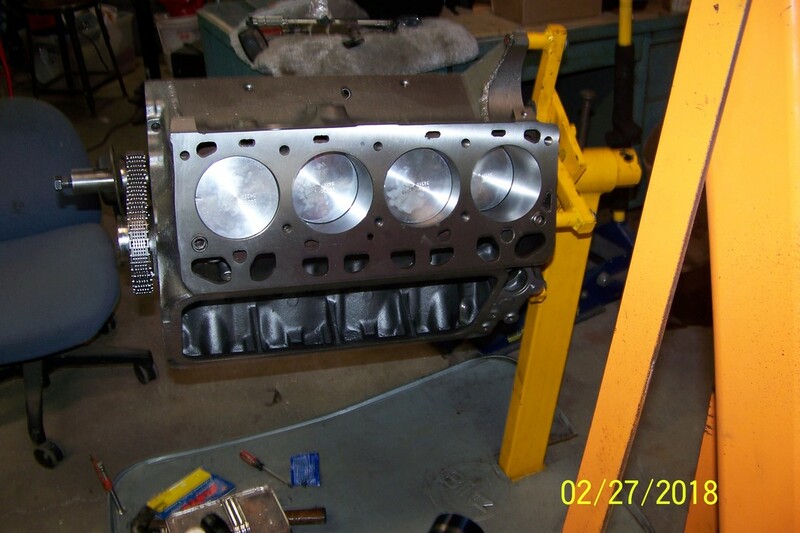 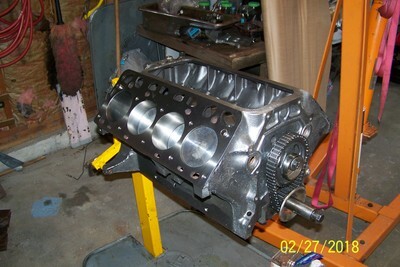 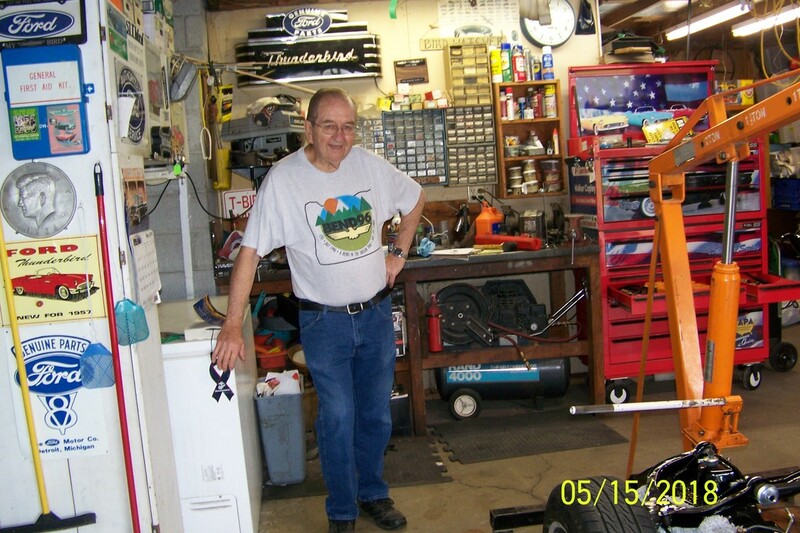 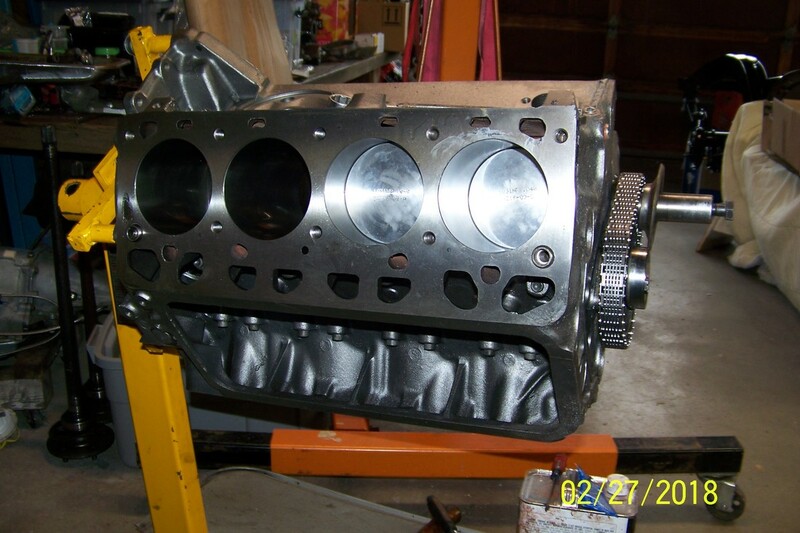 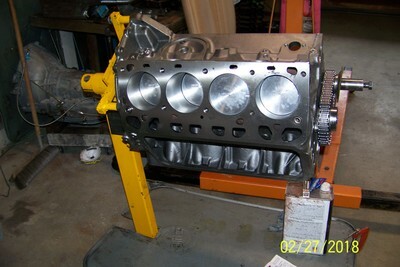 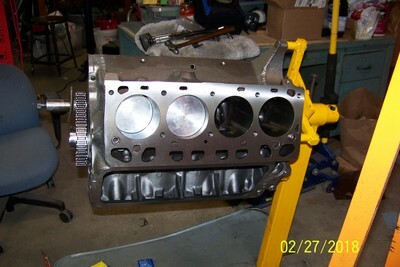 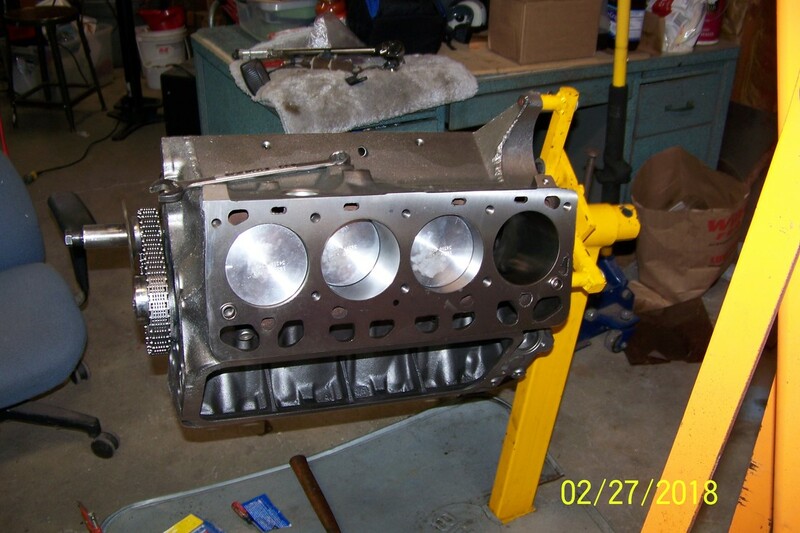 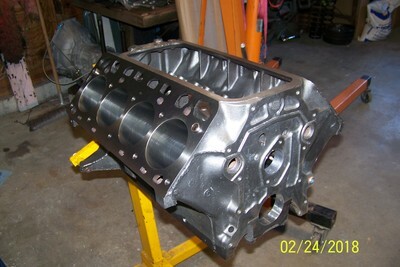 As you can see Howard Carlson helped me mount the transmission to the engine and then the assembly onto the frame. We are making progress but it is slow. 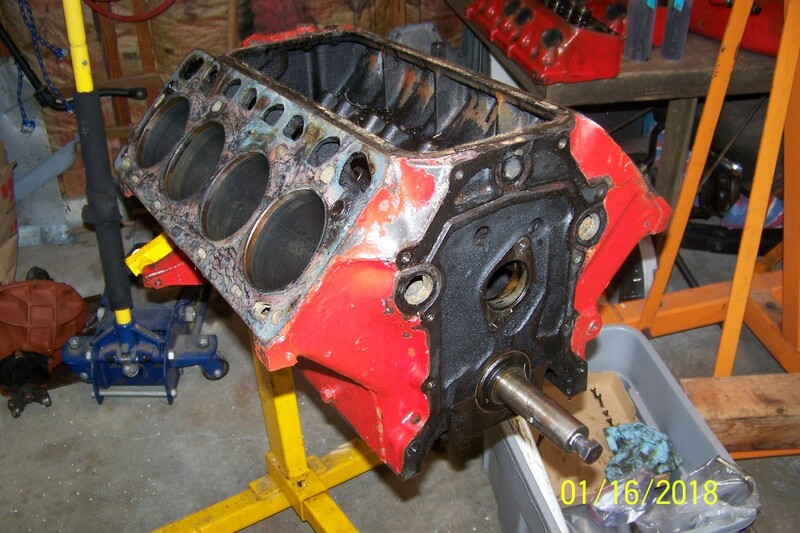 As of June 1st, 2018 I am planning on starting the engine up within the next week or two. Then came engine assembly. 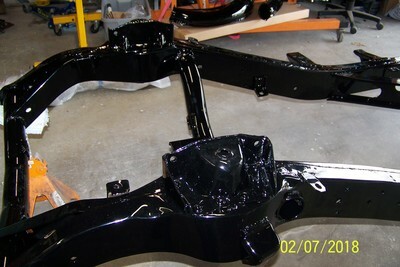 This is something that cannot be rushed and a bunch of pre-lube must be used. 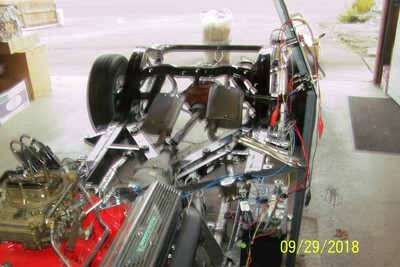 Without the pre-lube the engine bearings would be destroyed in the first few minutes of start-up. Even then there will be oil in the engine and the oil pump run by hand to pump oil through the entire engine prior to starting it the first time. 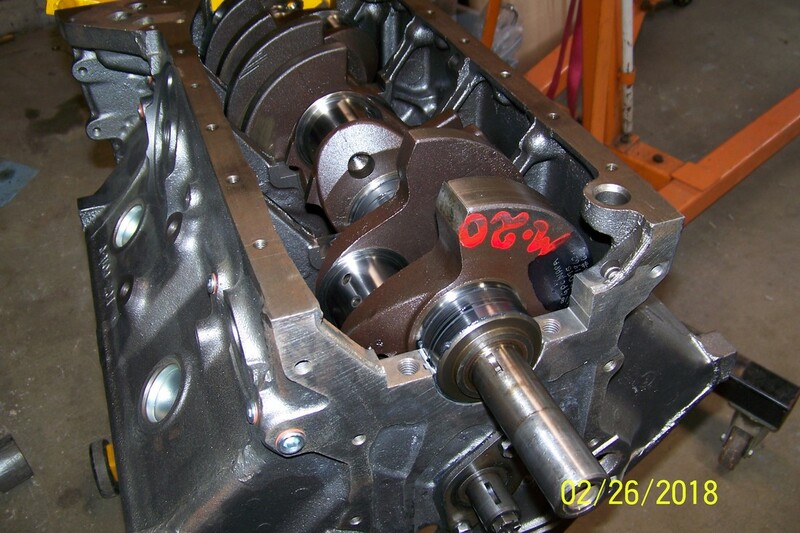 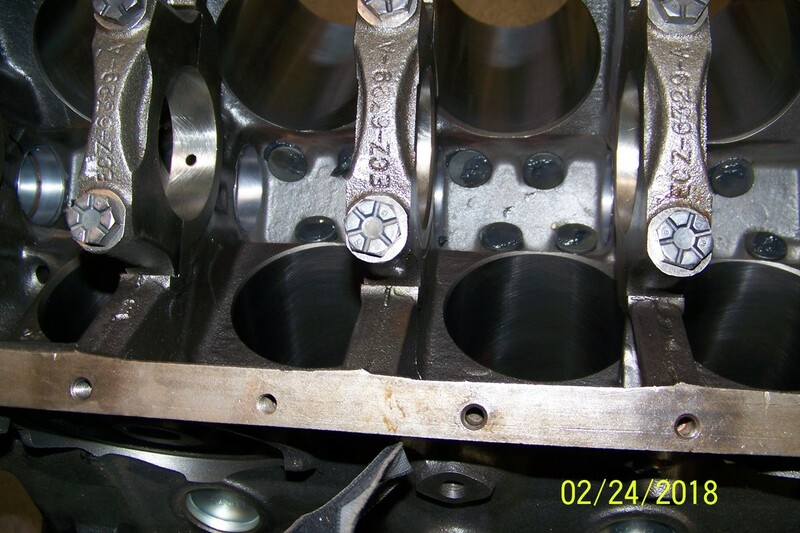 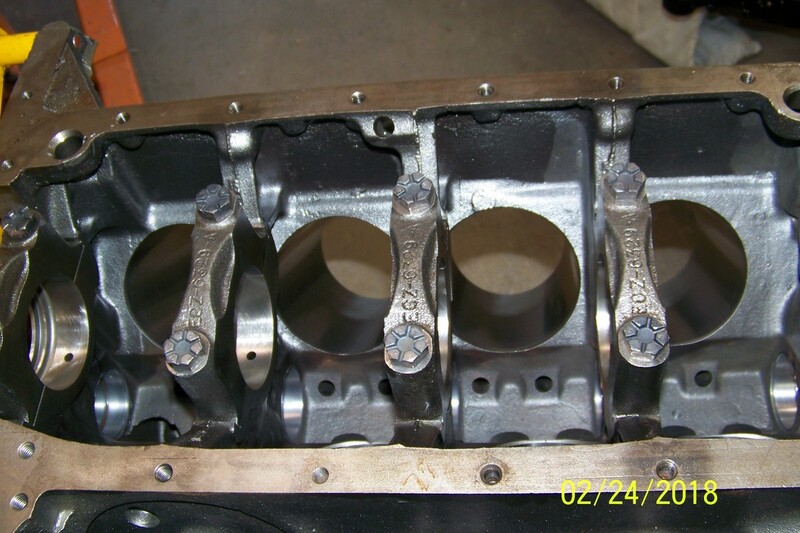 Setting up the timing chain is critical or the engine won't run at all. 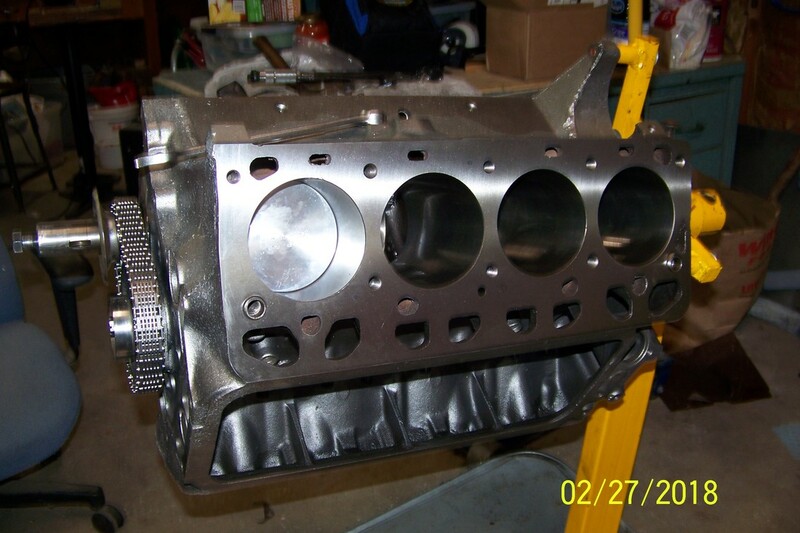 The Ford Y-Block is the only one I know of where the timing marks on the cam and crank do not line up with each other. 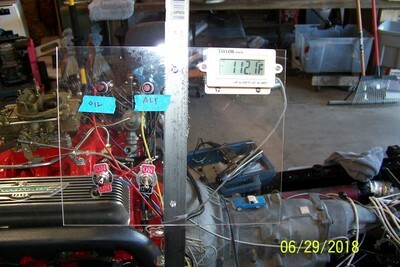 The cam is set about 3:30 PM (on a clock face) the crank about 3 PM and there must be 12 link pins on the chain between them. 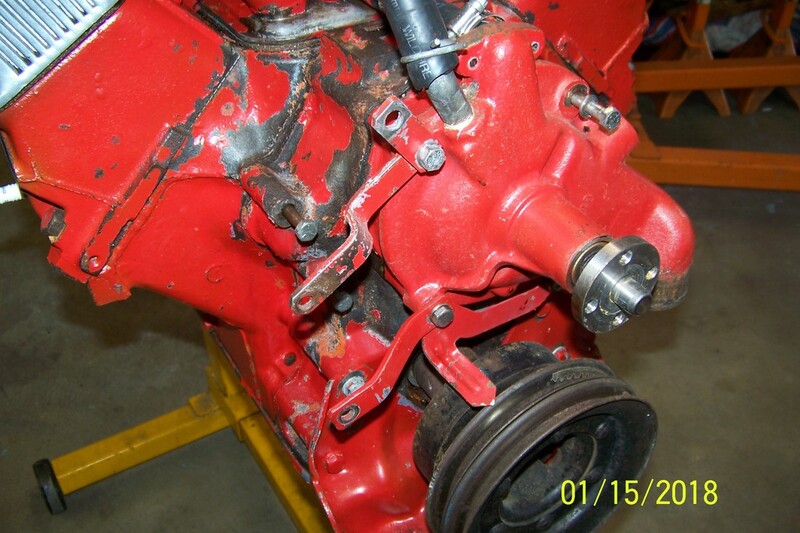 On one photo you can see red markings on the crank shaft. 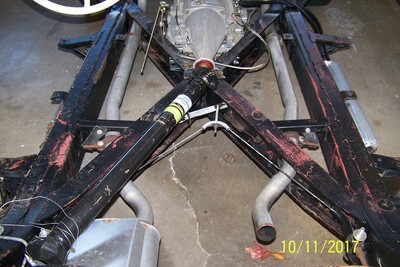 If you can turn that photo upside down in your mind it reads: M20. Which means the main journals are turned .020 undersize so .020 oversize bearings must be used. 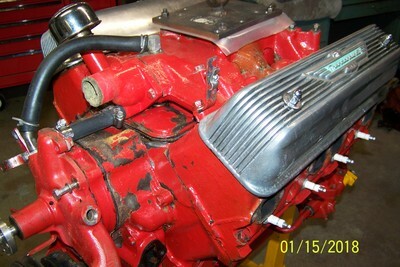 This is an extremely small amount considering the engine is over 60 years old and has over 300,000 miles on it. The black brackets will be removed when the engine is painted red and then put back on. 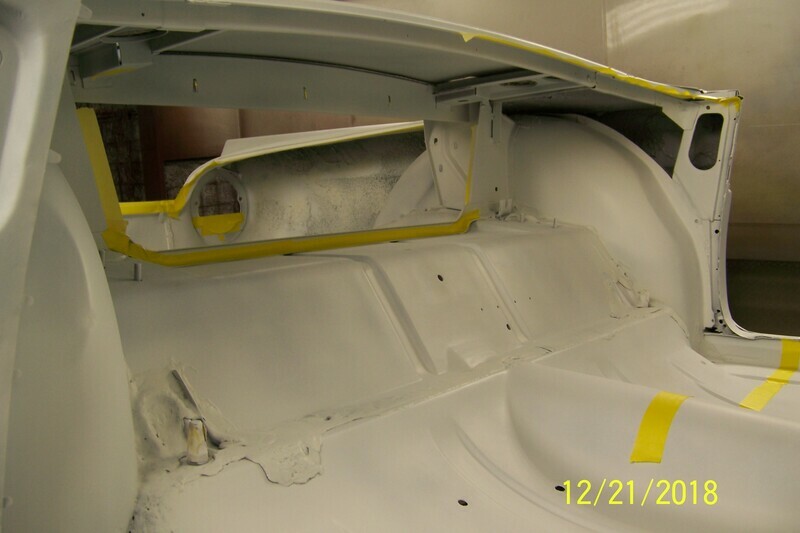 You can also see some masking tape to keep the manifold surfaces paint-free when it is painted. 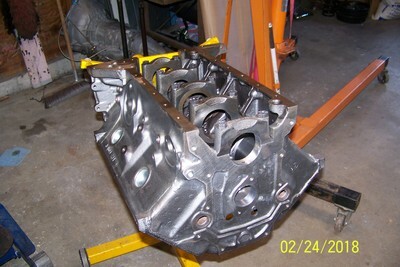 You may notice the photo dates below. 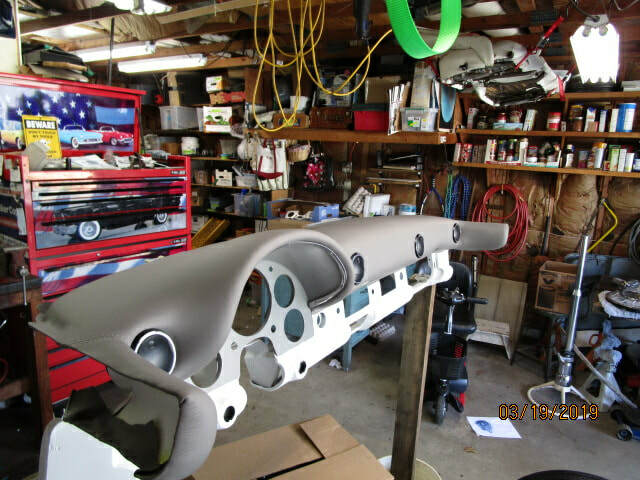 It took me over a month to assemble because I pulled the heck out of my back while working on it and didn't work on it for over two weeks. 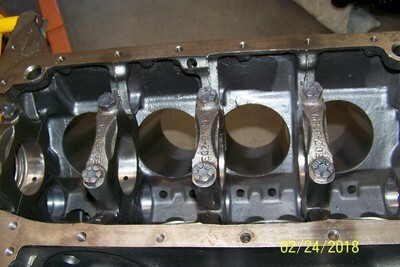 Then I had trouble with the rocker arms and push rods. 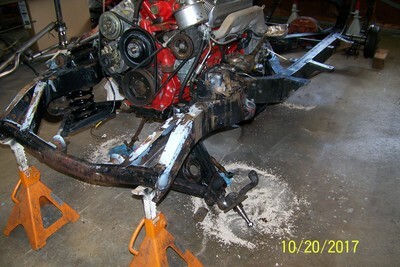 We had to get new, longer push rods which took about a week. 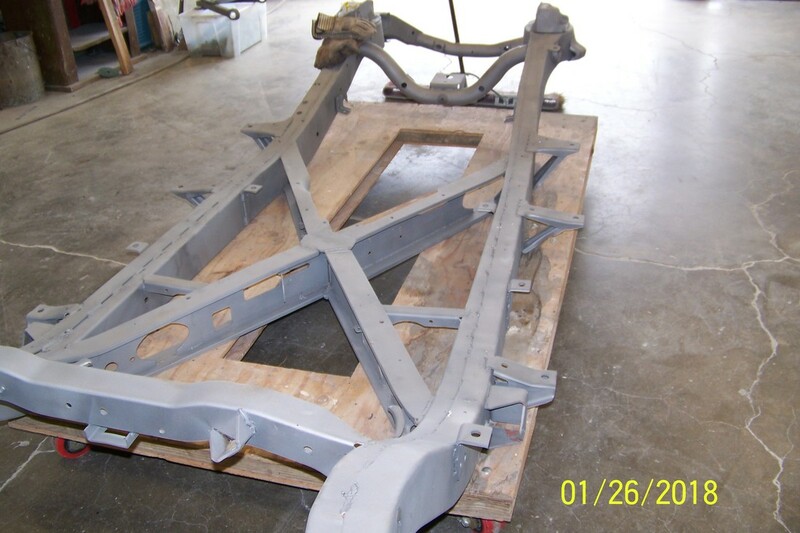 The photos below show the amazing transformation from the gutted frame to being sandblasted and then powder coated. 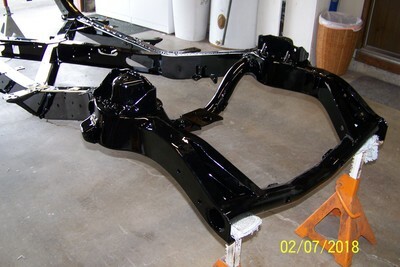 In addition to the frame we had 164 more pieces cleaned, sandblasted (or hand stripped) and powder coated. 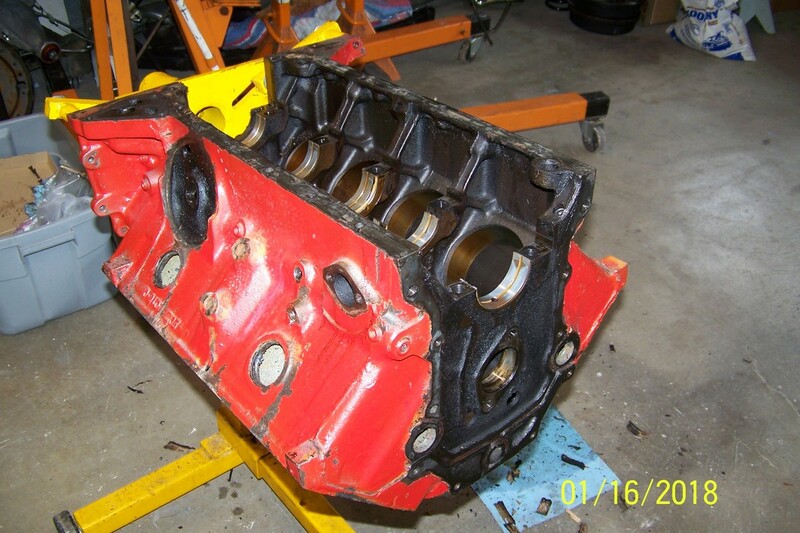 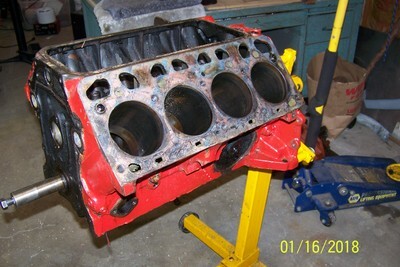 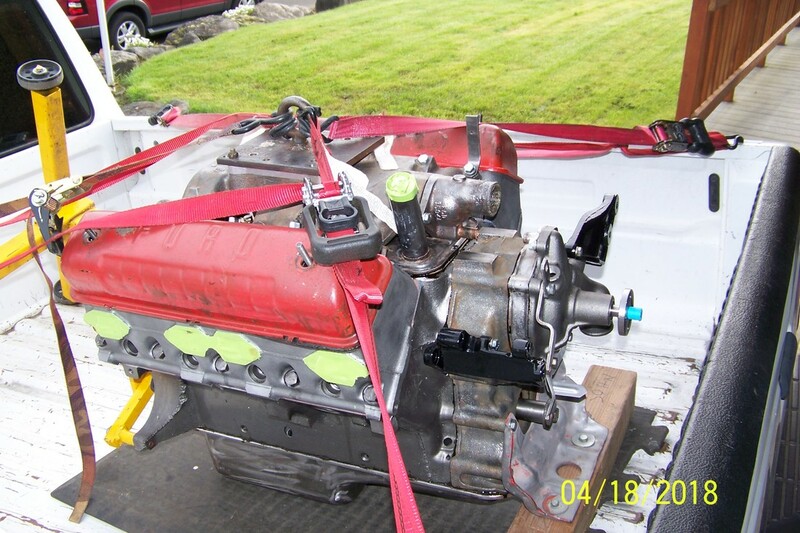 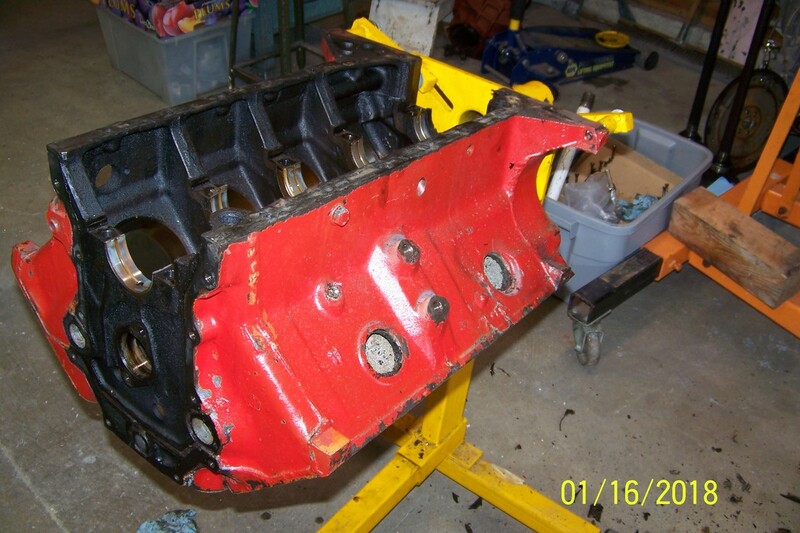 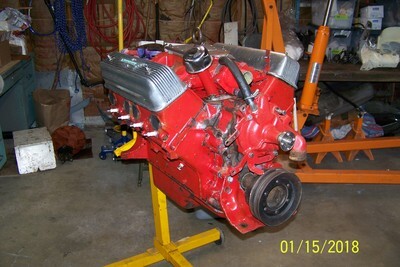 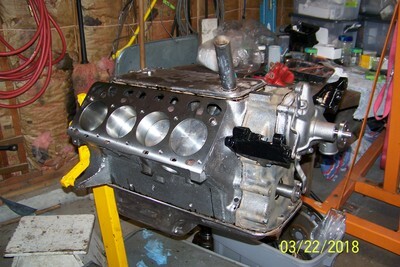 While the frame was gone I tore the engine down to get it ready for the machine shop. 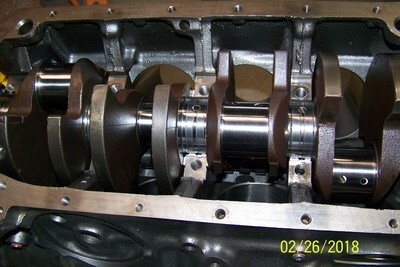 I used a machine shop that I am very familiar with. 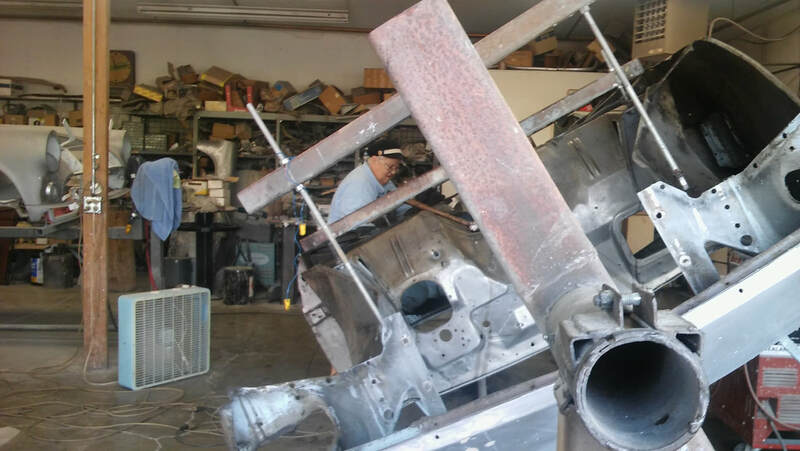 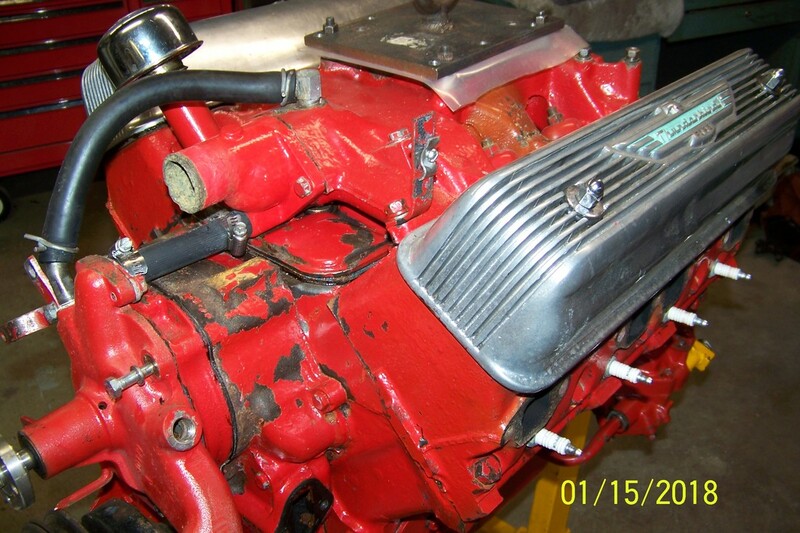 The machine shop at Eastside NAPA is very familiar working on older engines and do so at a fair price. 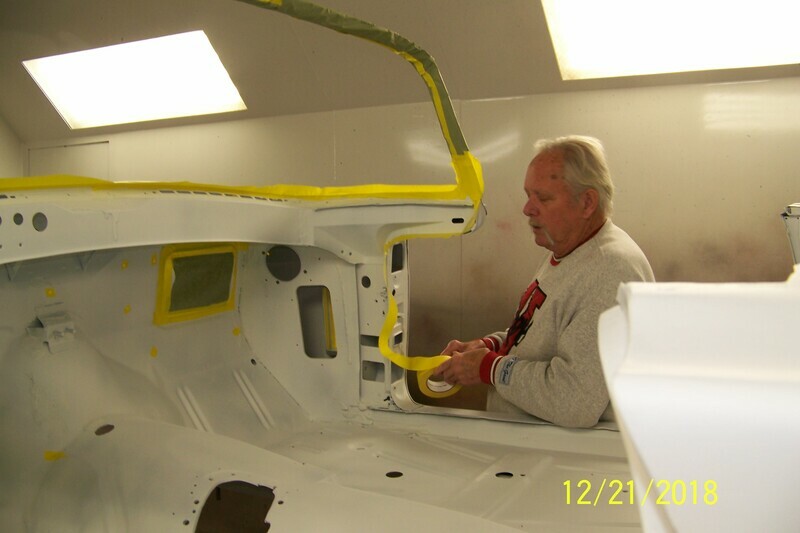 They are very detail driven and have always done a great job for me. I think this was the sixth engine I've taken to them in the past 15 years. 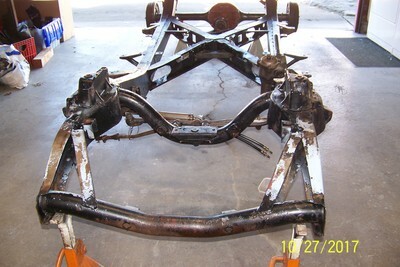 After getting the frame home we had it steam cleaned which removed over four decades of road grim and grease. Then I went about removing everything from the frame. As you can see in the photos I got it down to a bare naked frame. After removing everything the frame and suspension went to the sandblaster and to the powder coater. 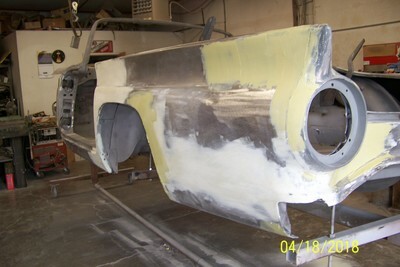 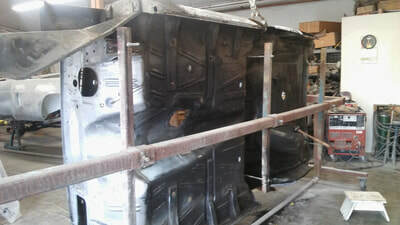 After getting all of the undercoating off Dave, Howard and I trailered the body to a sandblast facility. They got the work done very promptly and we got the body back to Dave's shop. He then went to work on it. After a five week vacation driving to New Jersey and the Gulf Coast Oleta and I spent about six days removing all of the undercoating from the floor board, inner fender panels and bottom of the car. 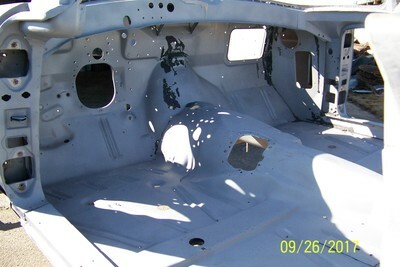 I thought removing the paint was tough until we started removing this junk. We came home each night exhausted and filthy dirty but it was well worth it to get the body ready for sandblasting and body work. 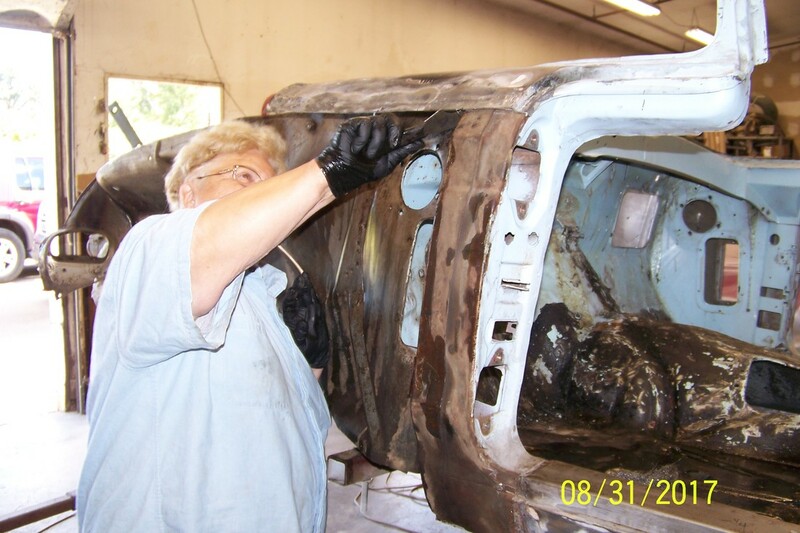 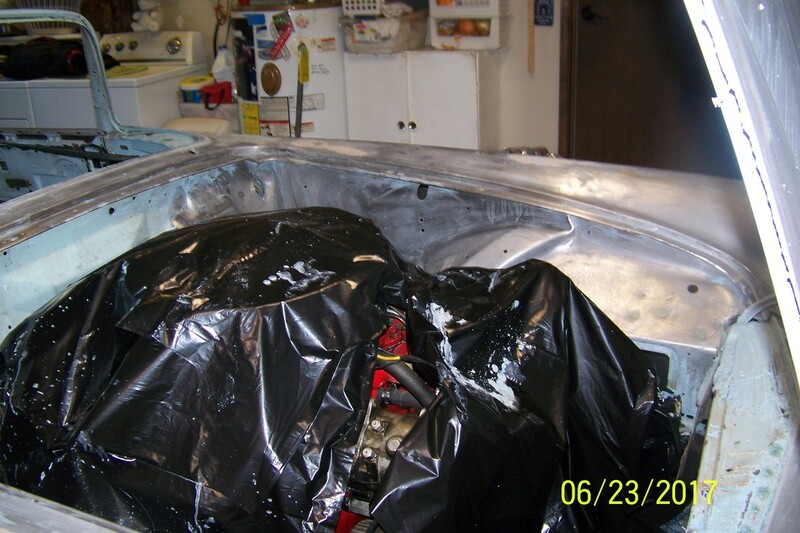 Also with the body on a rotisserie I was able to get inside the engine compartment and finish removing the paint from there. Dave determined that the LF fender needed to be replaced. 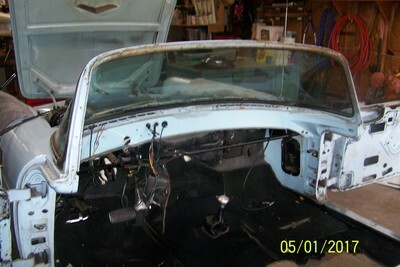 It was so beat up from a wreck before I bought the car in 1966 it was cheaper to replace than to repair. The third major step was getting the body to Dave Van Winkle's shop for body work and paint. Next came stripping all of the paint from the car. Thank goodness for strong paint stripper but it is still a lot of work that is very messy. 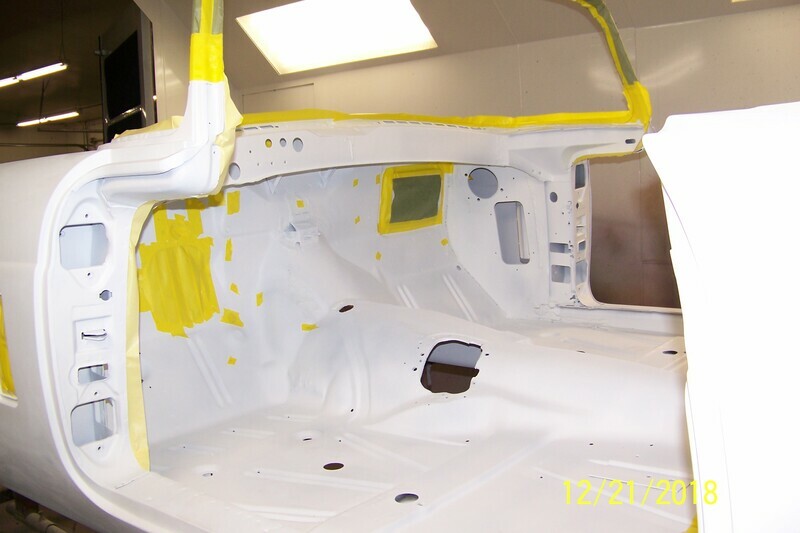 We went through about five (5) gallons of paint stripper and made a huge mess doing this. 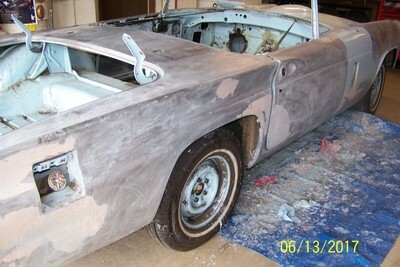 However, removing all of the paint revealed a lot of body puddy that I had forgotten about from the 1970 project. 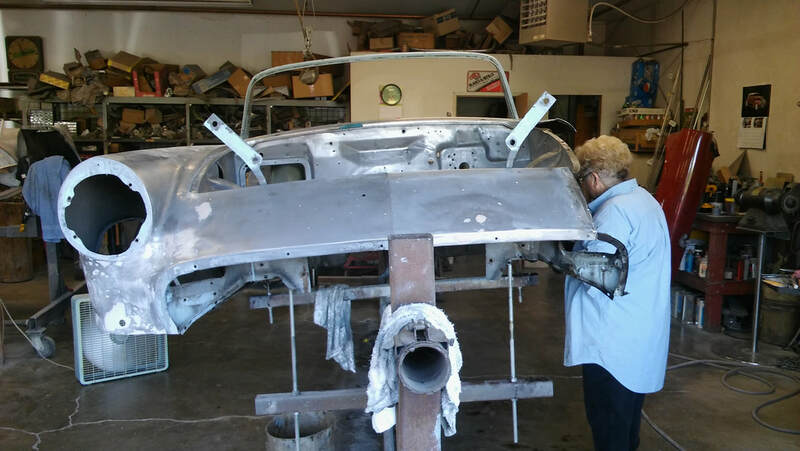 Starting the project meant taking the car apart. 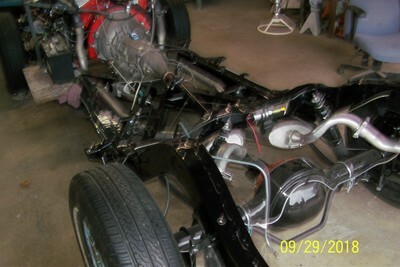 And I did take it apart. 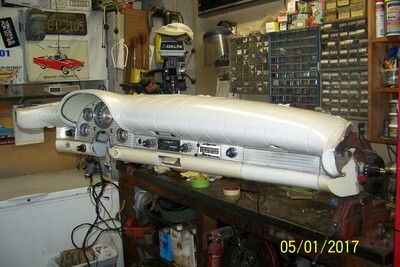 One huge headache in a project like this is keeping track of the parts and the attaching parts. As the disassembly proceeded all of the parts were placed in labeled bins, nuts, bolts, screws and small parts were all stored in baby-food jars and labeled. Notice that even though some of the photos are dated 2016 they were taken in 2017. I had my camera date set wrong and it is not possible to change those dates.